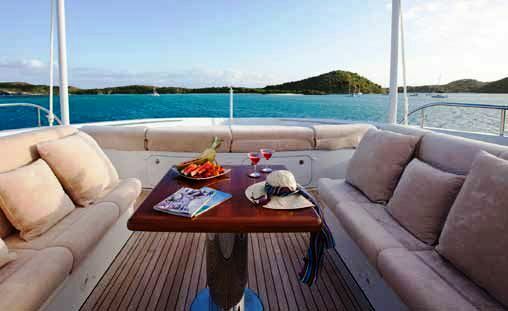 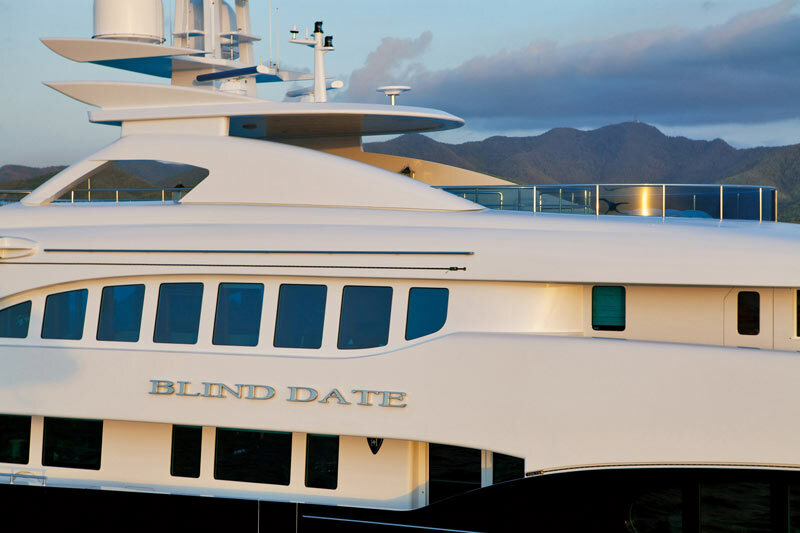 Luxury motor yacht BLIND DATE was launched by Hessen yachts in 2009. 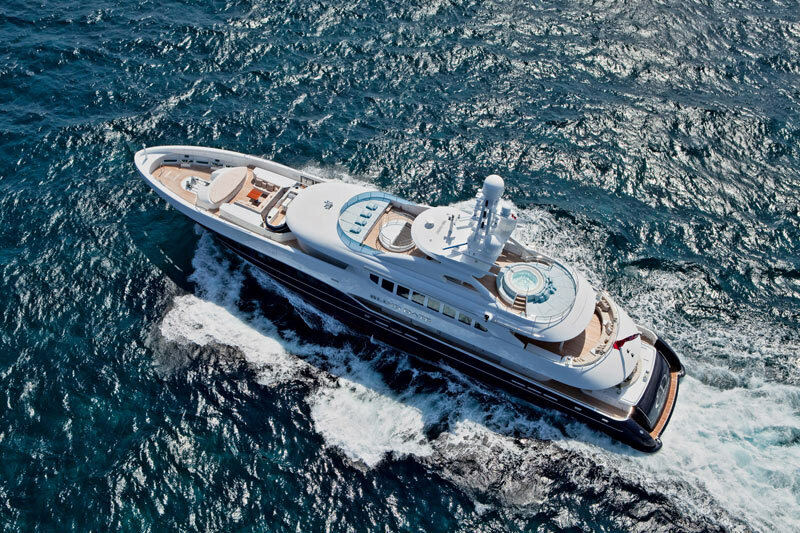 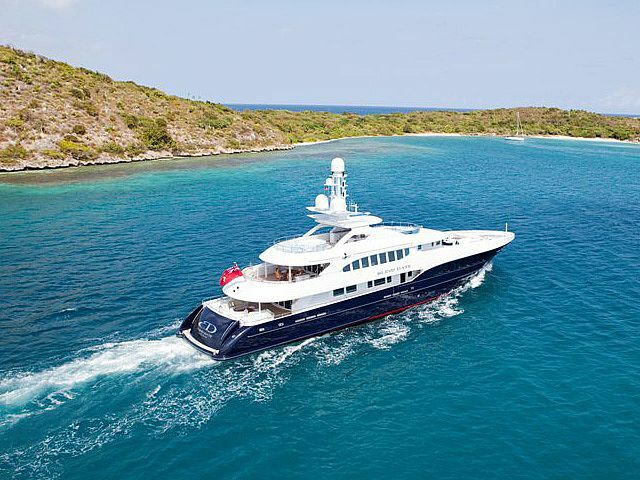 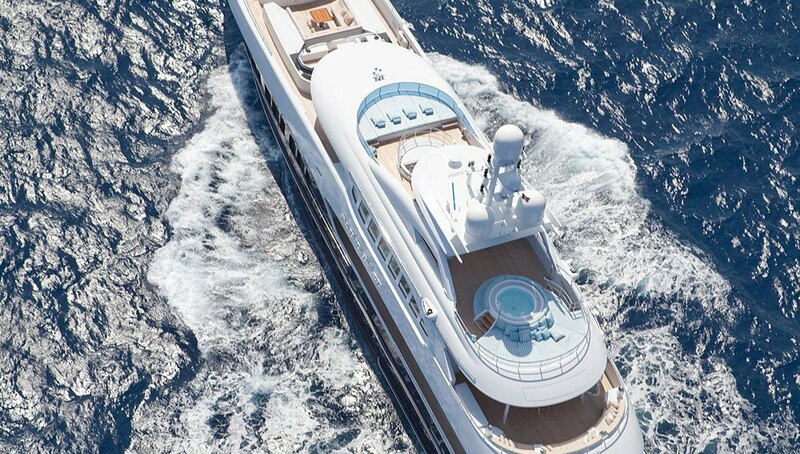 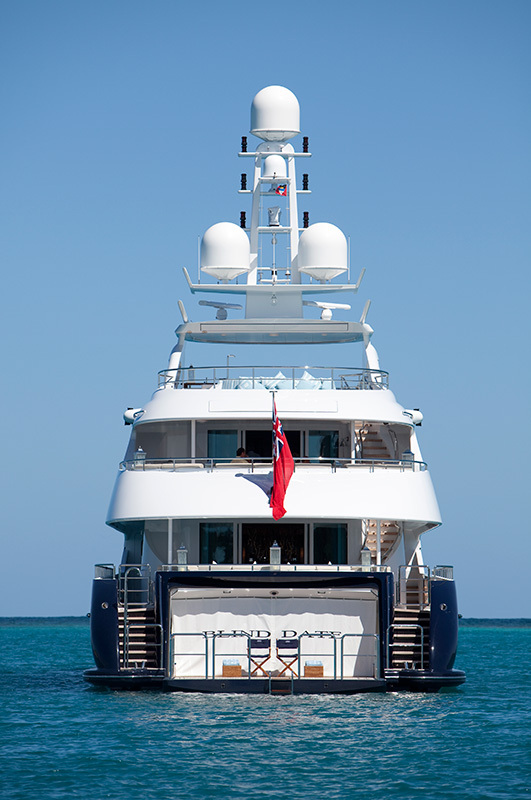 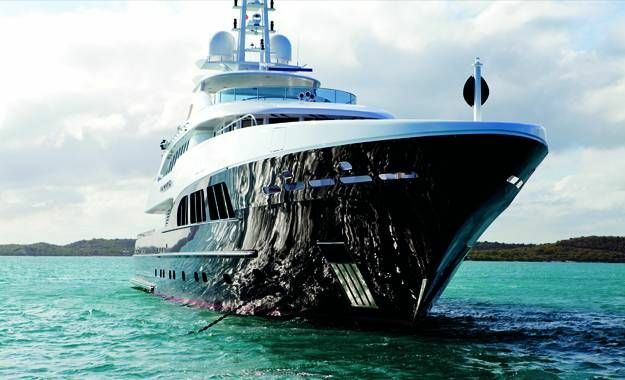 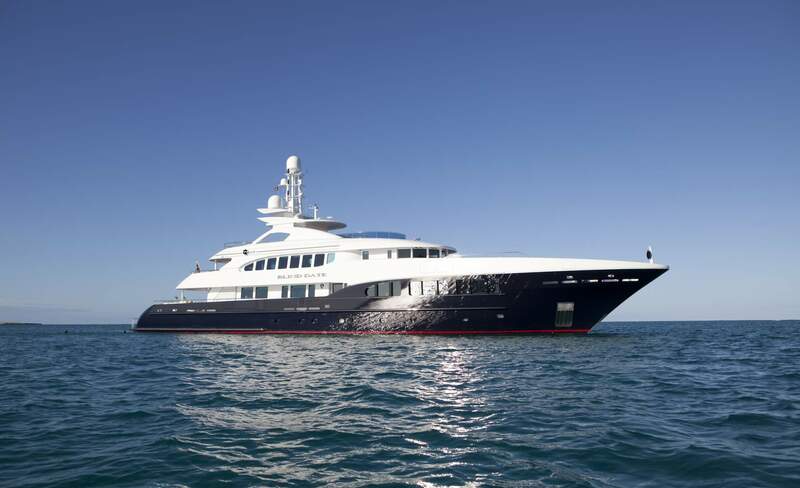 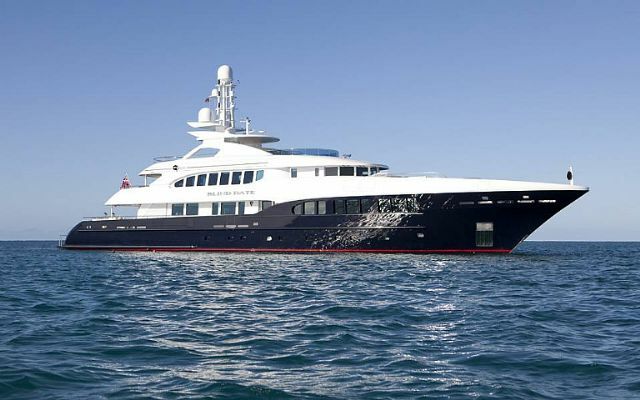 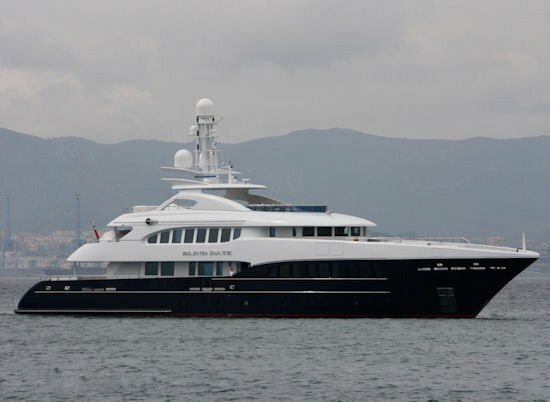 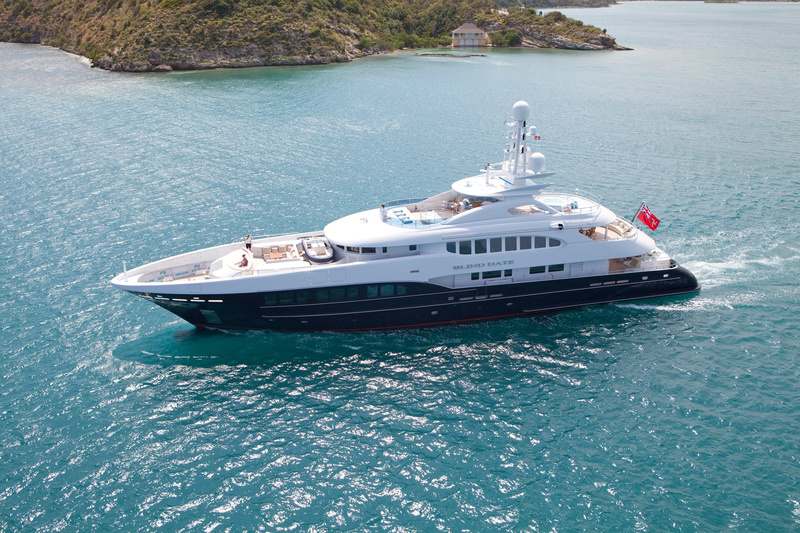 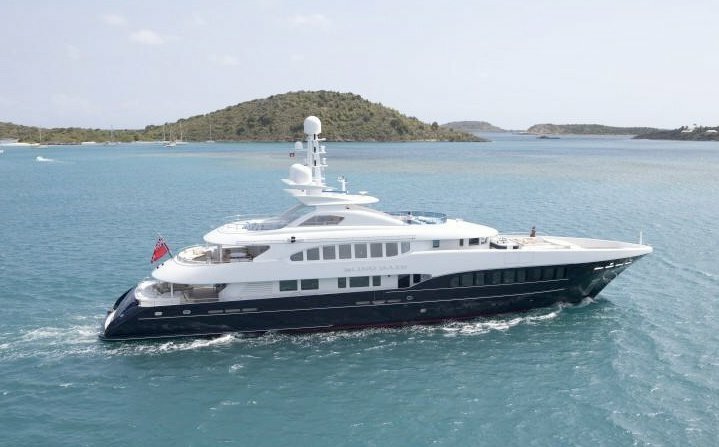 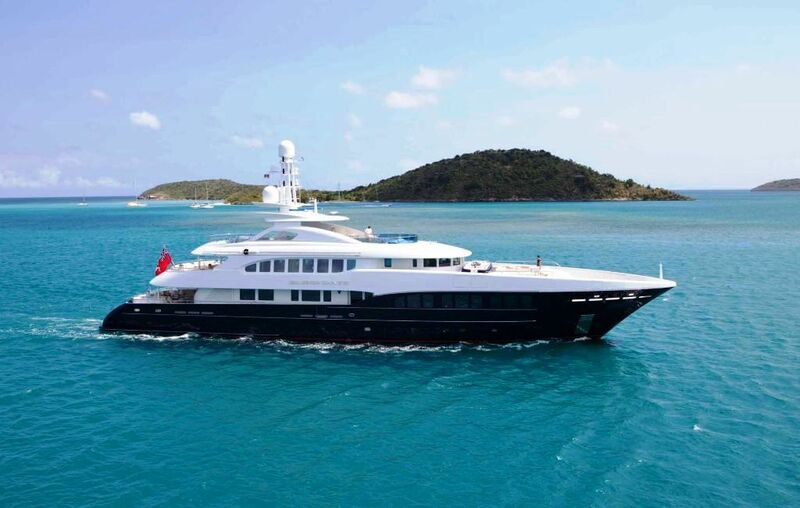 She measures 46.70m and features exterior design by Heesen and Frank Laupman and exceptional interior design by English designers, Keech Green working closely with the Owner. 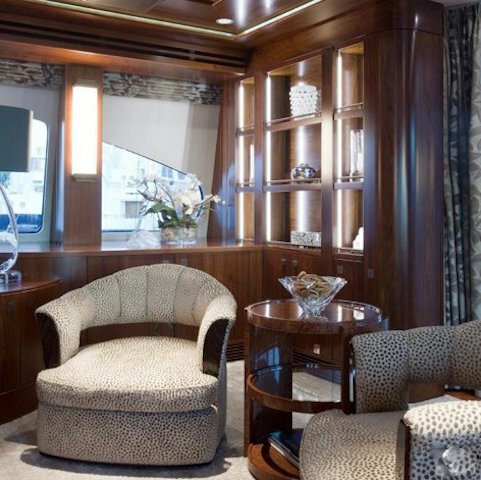 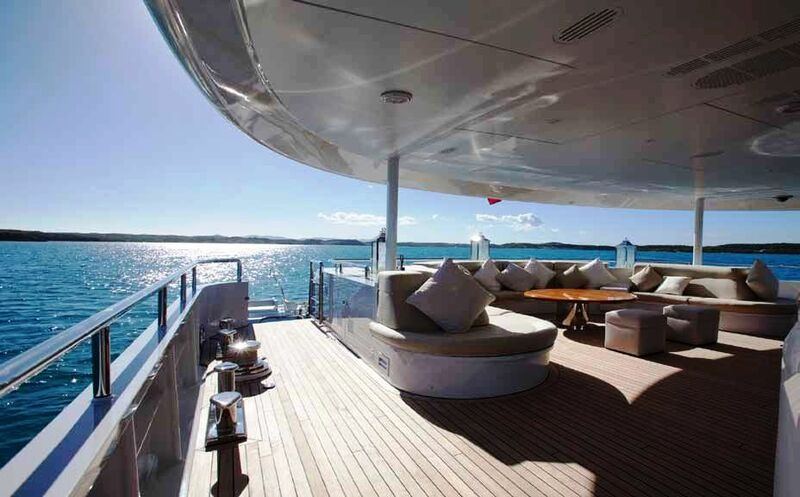 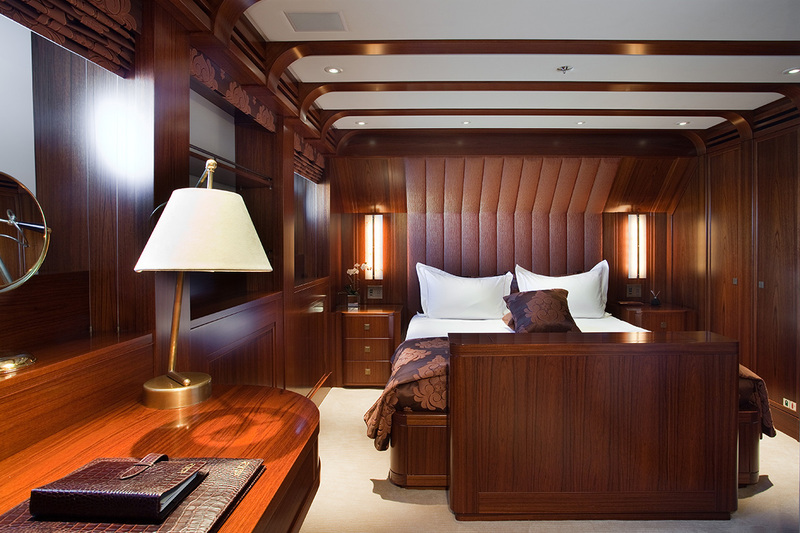 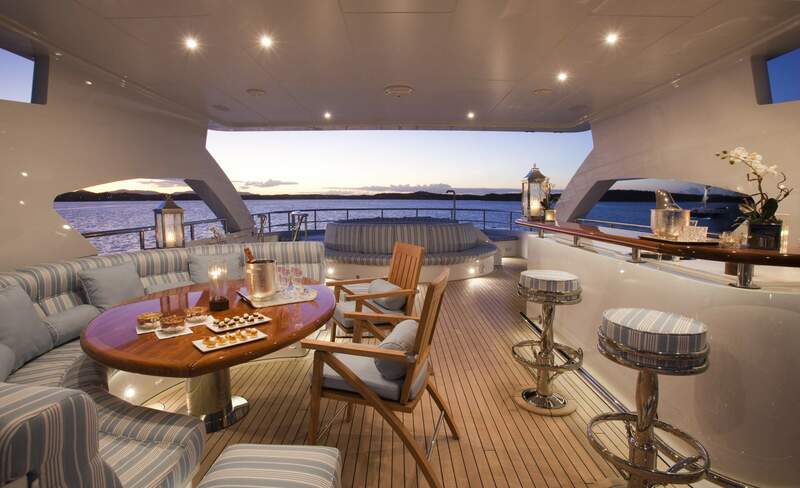 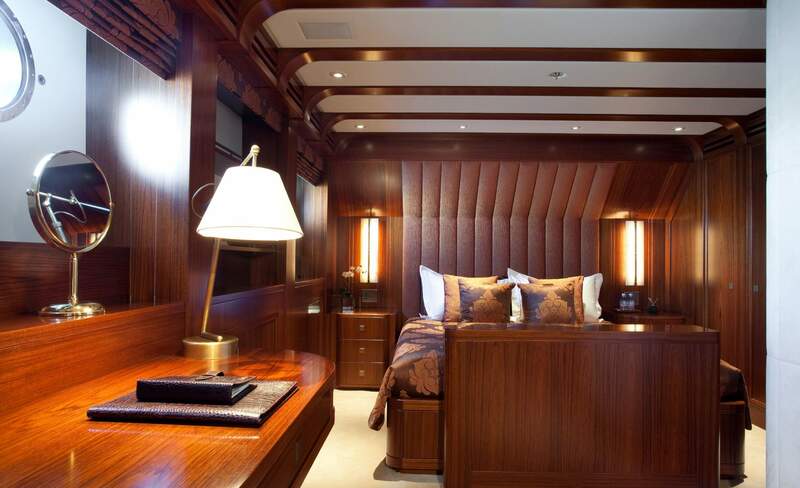 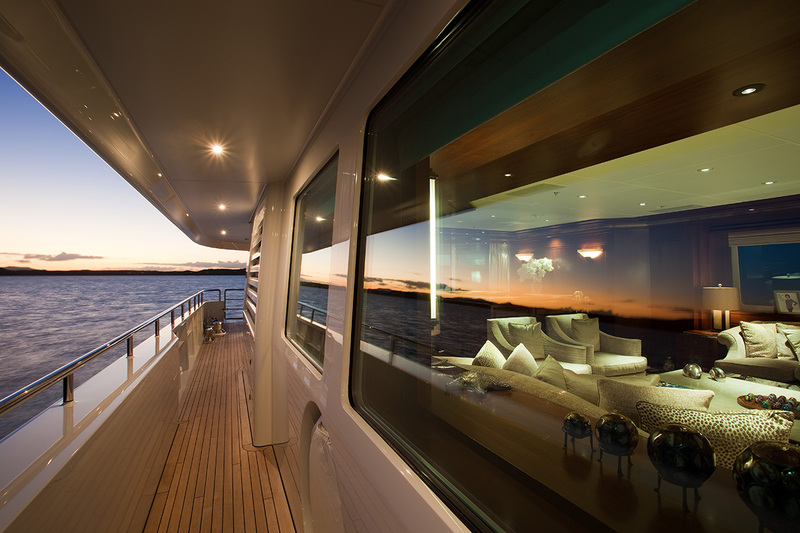 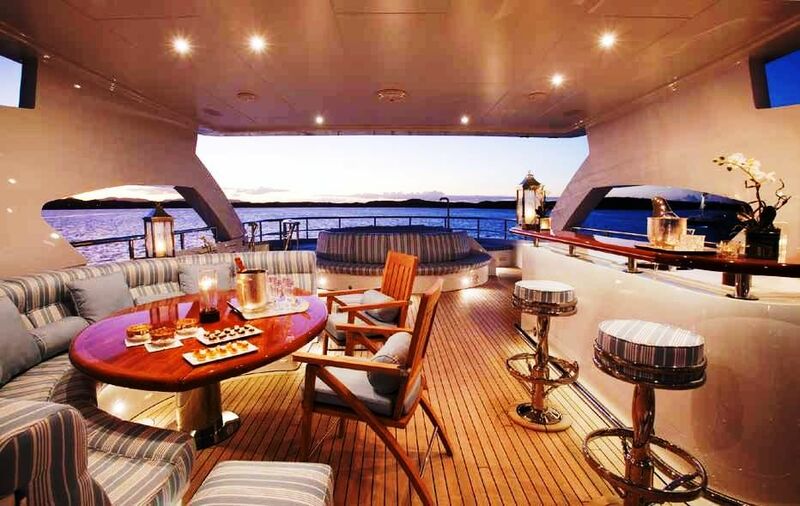 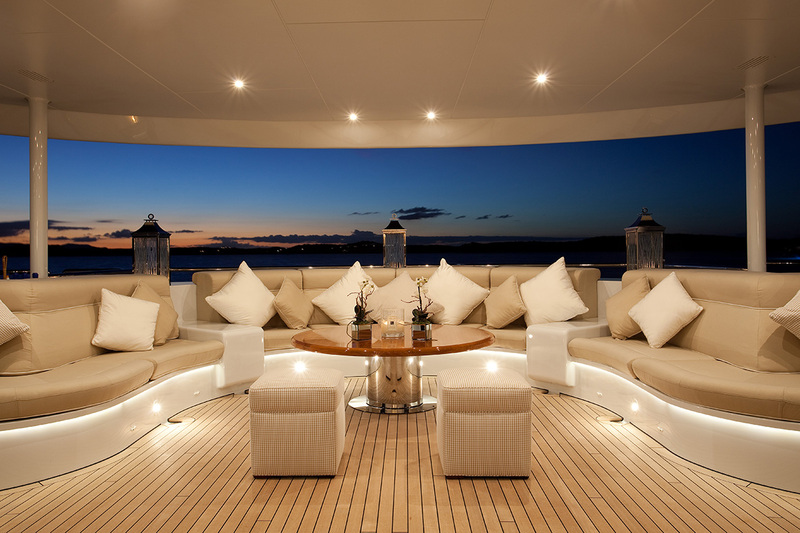 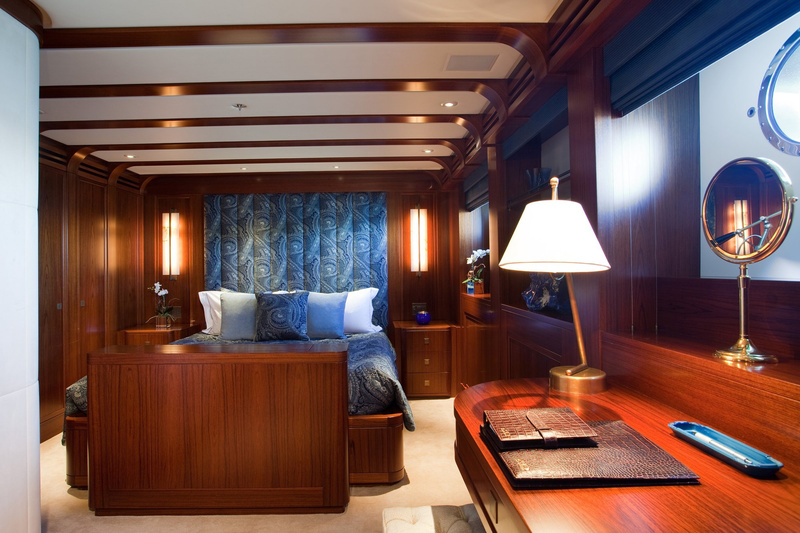 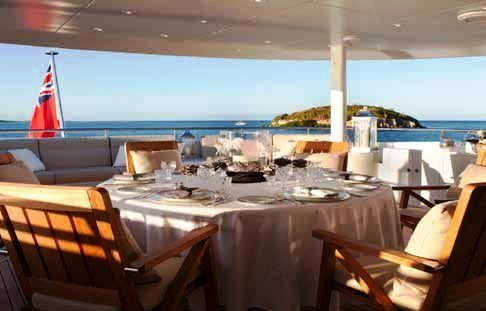 M/Y BLIND DATE has a Modern Deco interior style that is comfortable yet offers timeless elegance and glamour. 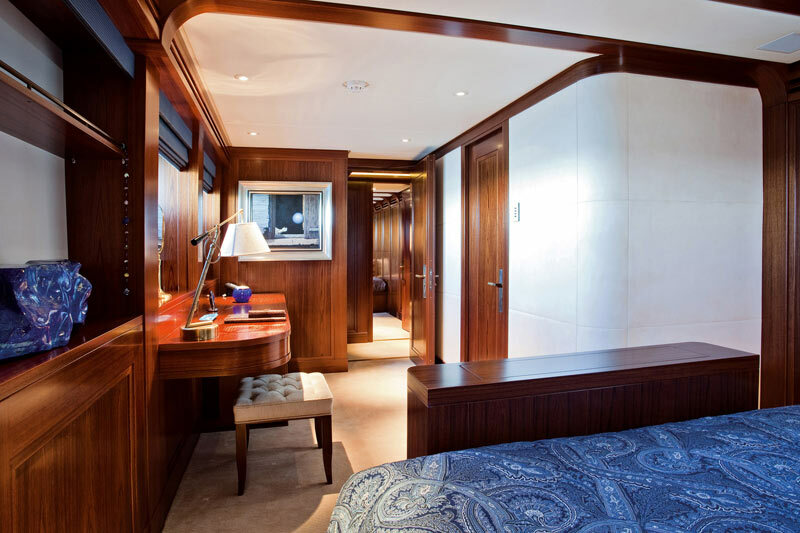 She can accommodate 10-11 guests in 4 double cabins and one twin with Pullman bed. 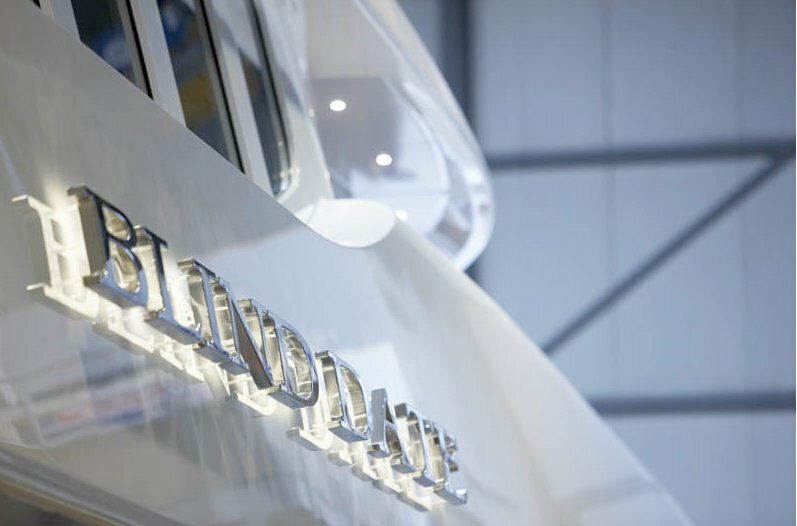 Motor Yacht BLIND DATE is the 5th 47m displacement yacht for Heesen with unique customization which distinguishes the new yacht from her 4 older sisters. 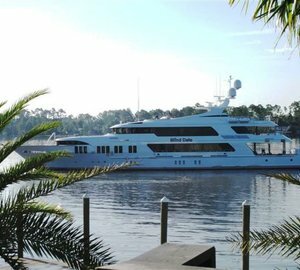 BLIND DATE’s exterior is streamlined and flowing with a ‘pelican beak bow.' 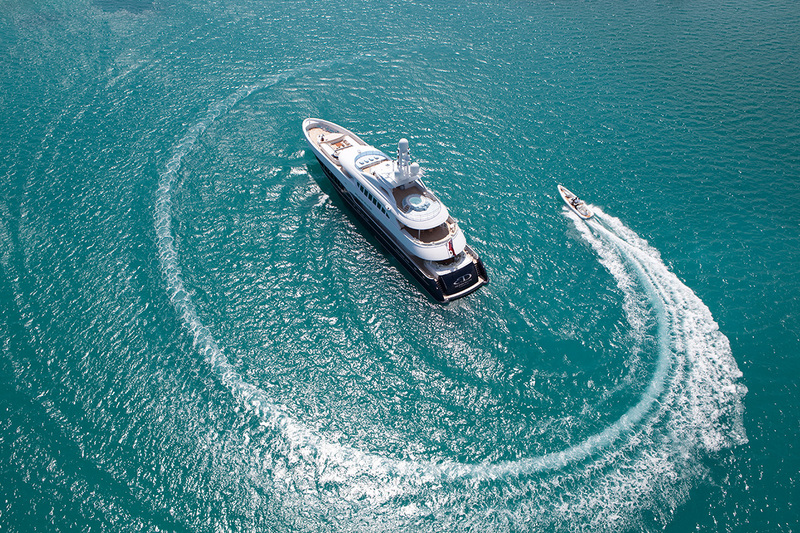 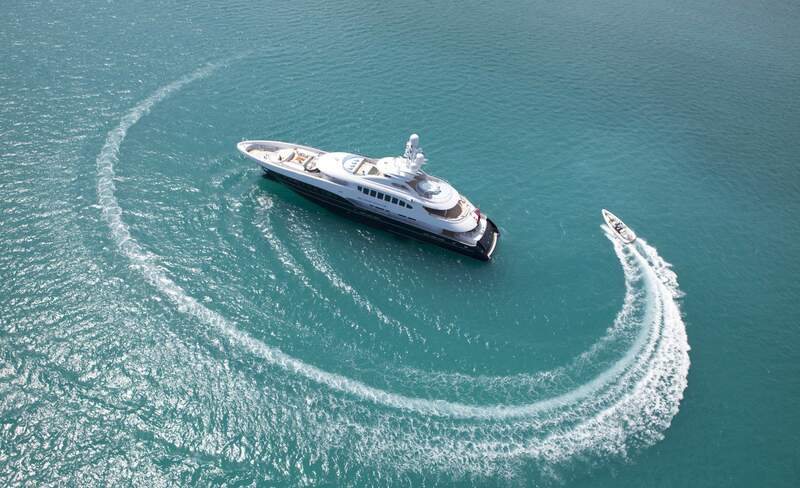 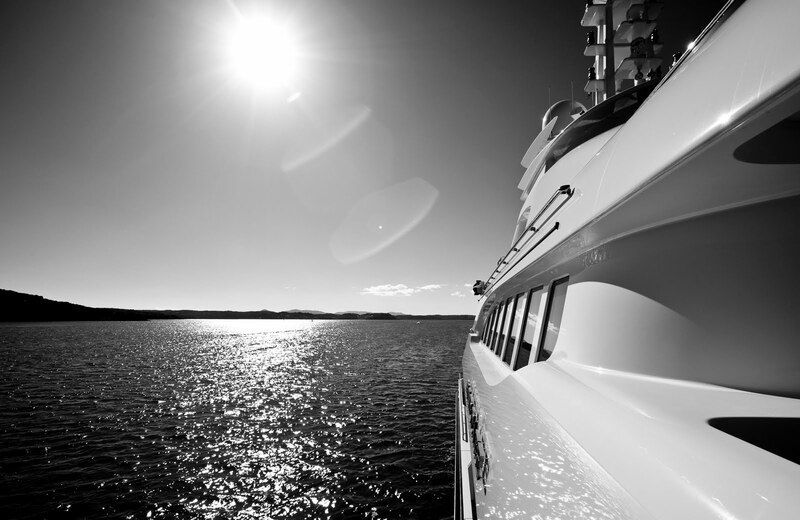 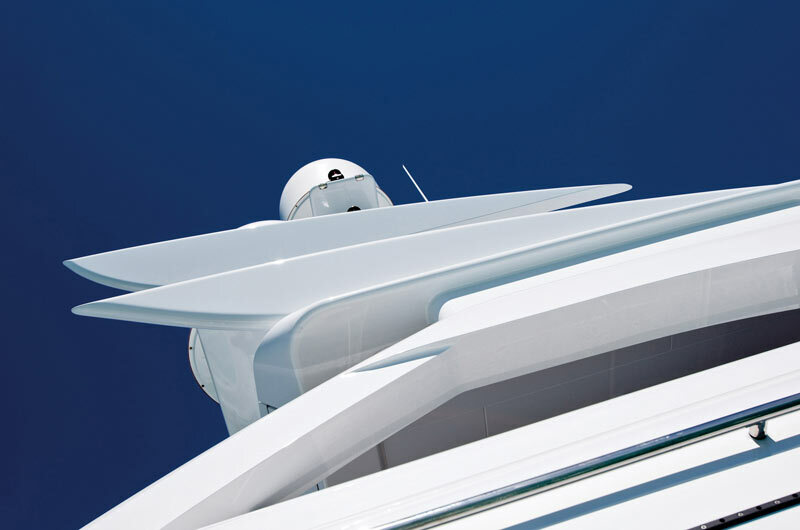 This negative sheer bow styling is now established as one of the Heesen Yacht’s trademarks. 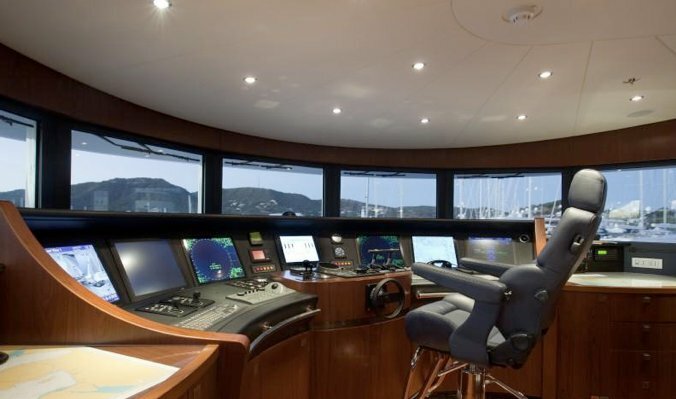 Other features that set her apart is her wheelhouse deck extension that contains a gymnasium and a staircase which connects all of her four decks. 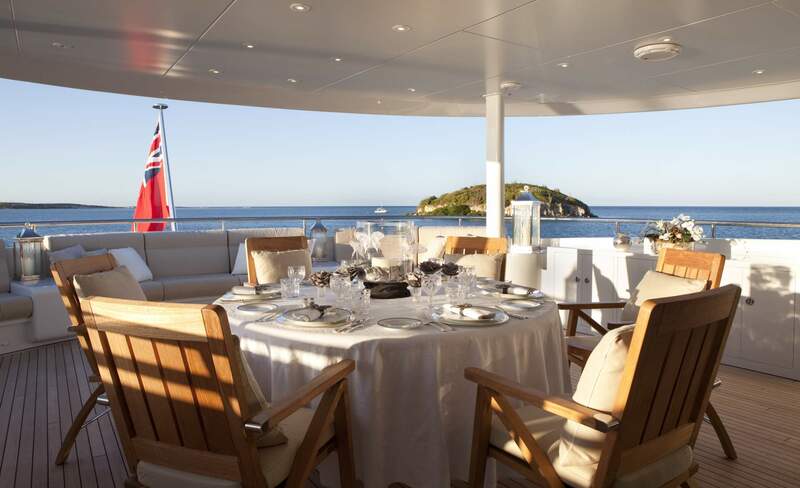 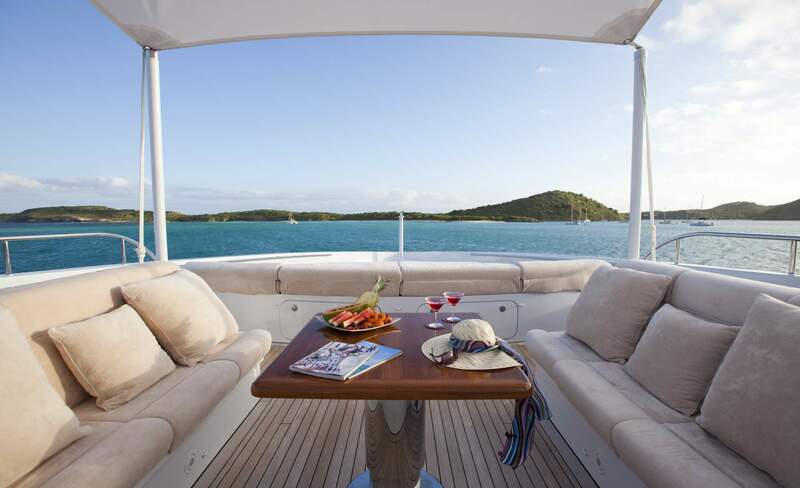 On deck, there are endless choices for dining, relaxing and sunning including a full dining suite on the aft bridge deck and sundeck plus casual lounges ideal for cocktails on the main aft deck and foredeck. 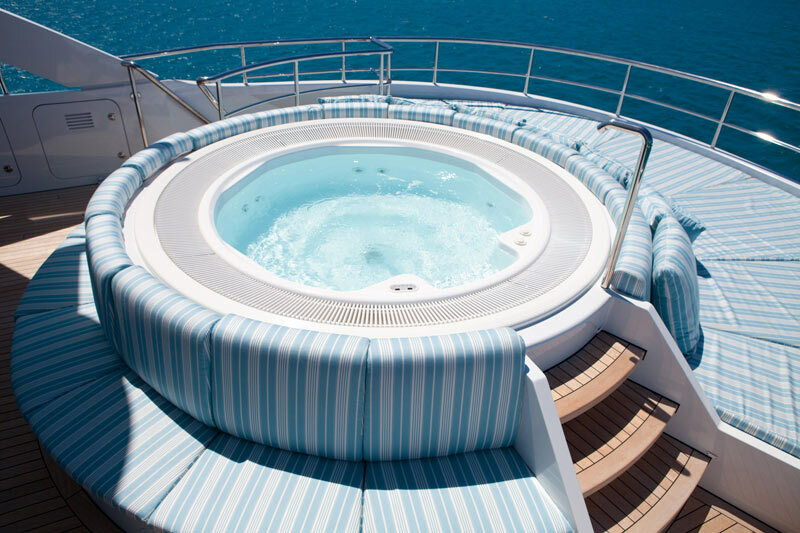 The sundeck is also equipped with a large spa pool and sunpads for guests to enjoy the sun. 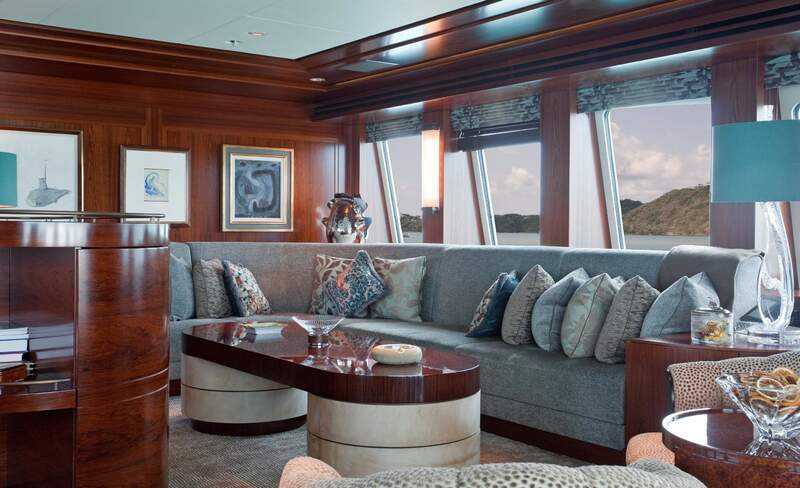 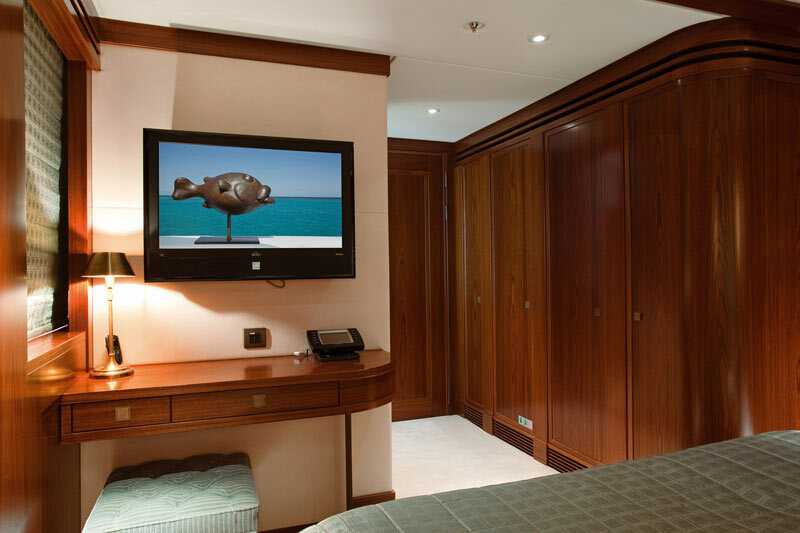 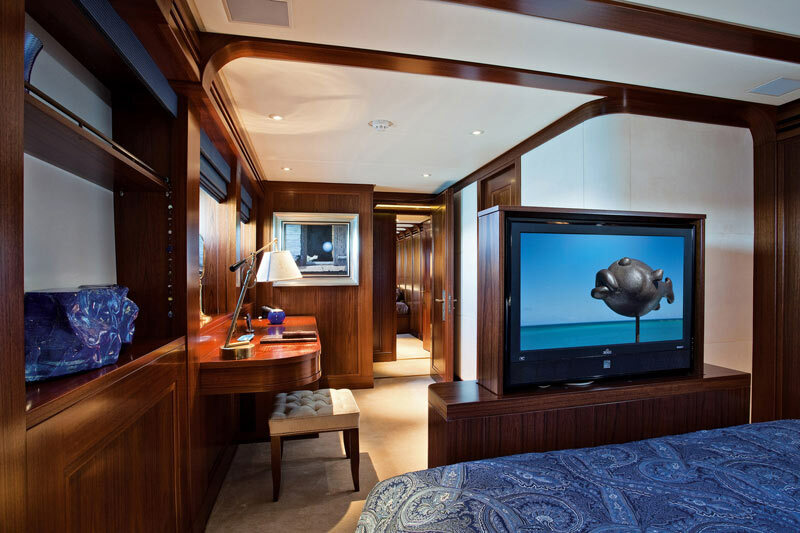 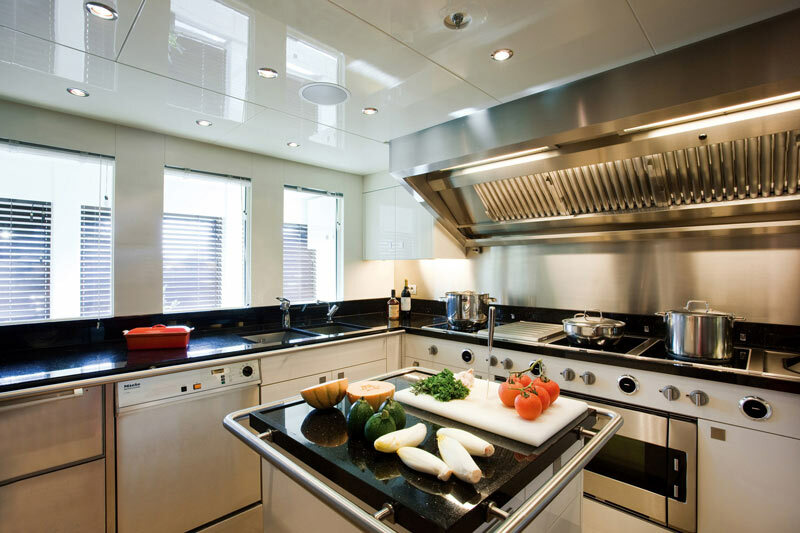 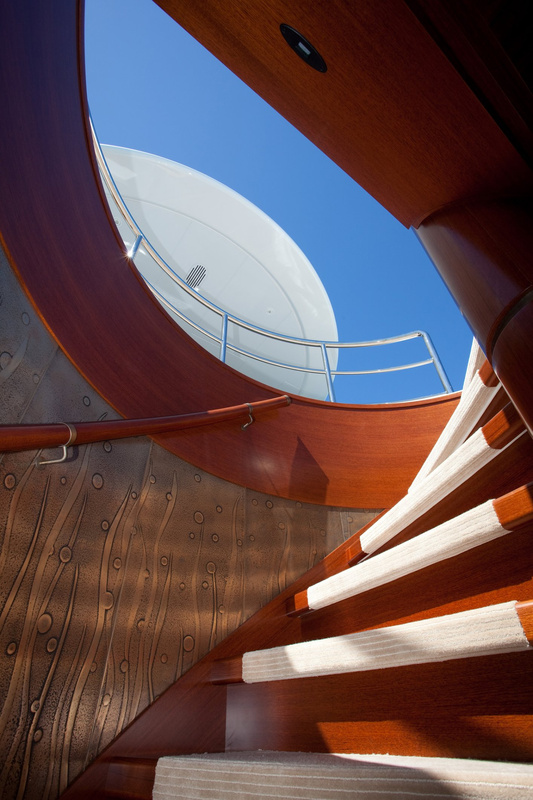 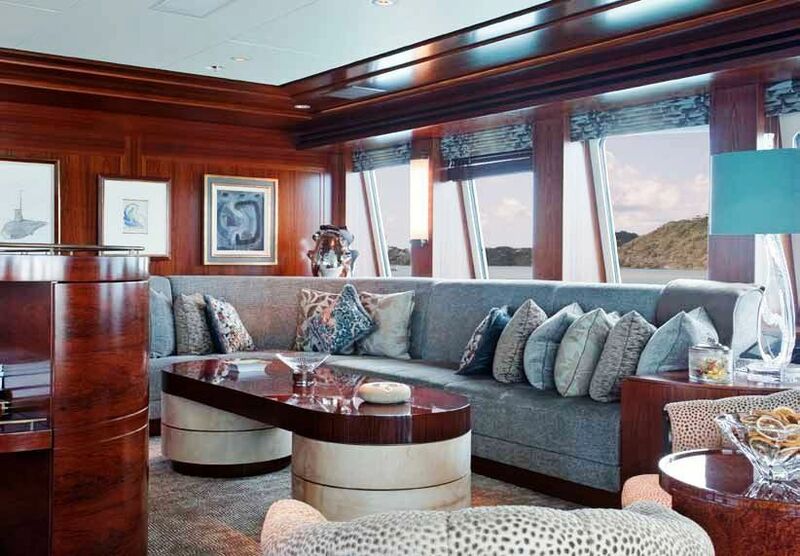 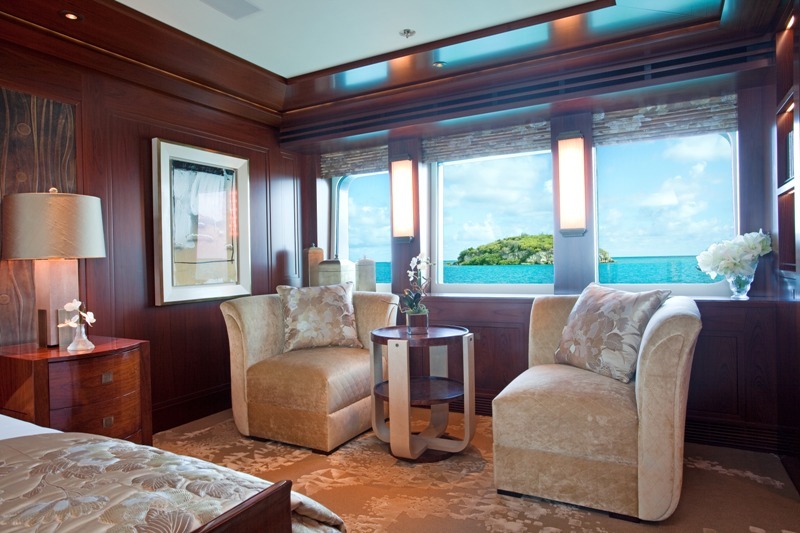 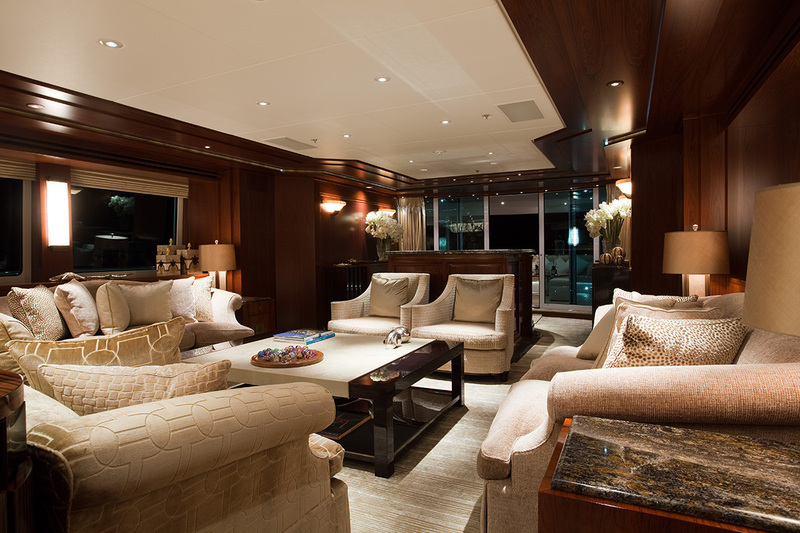 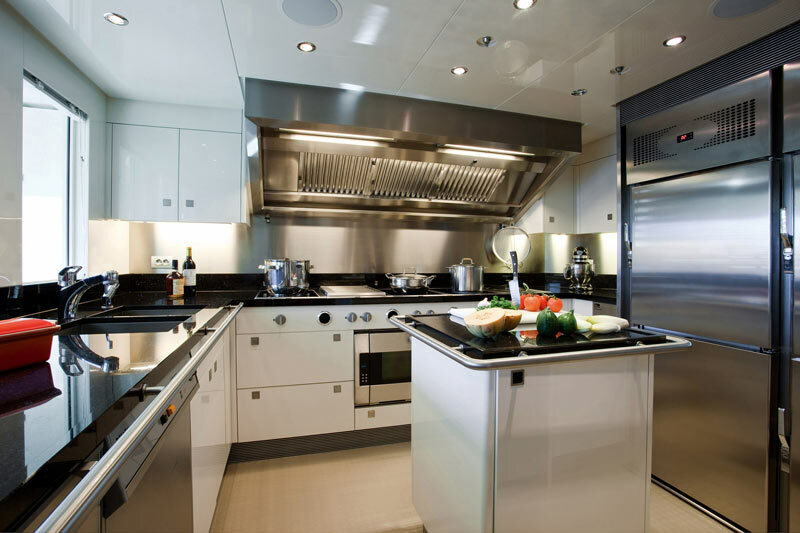 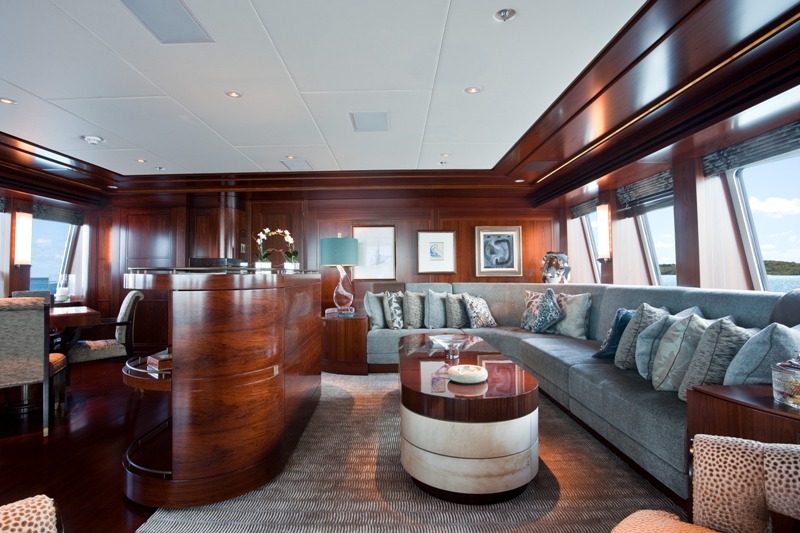 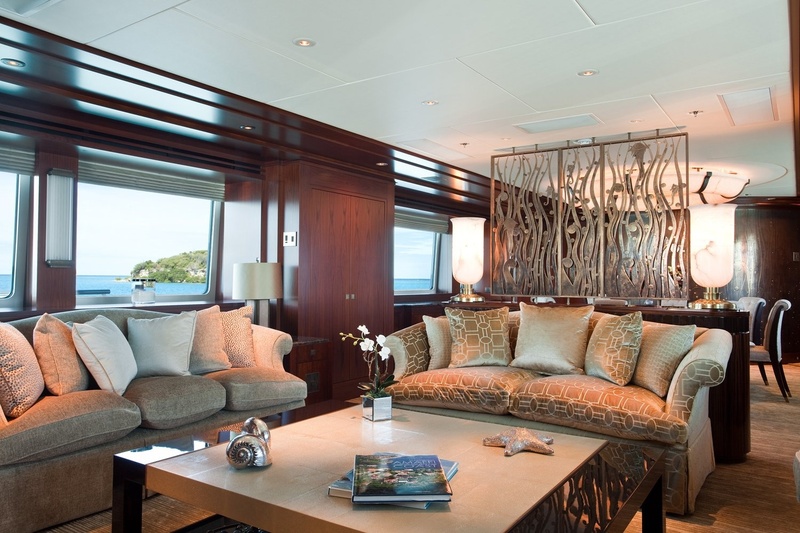 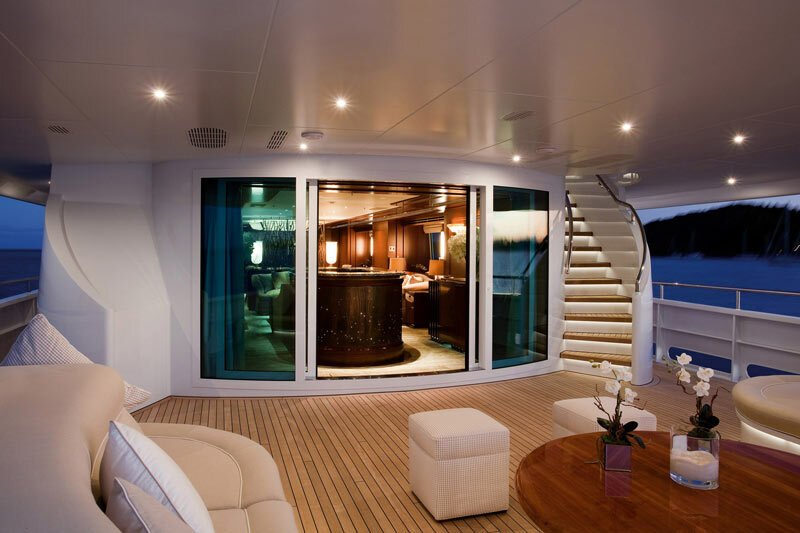 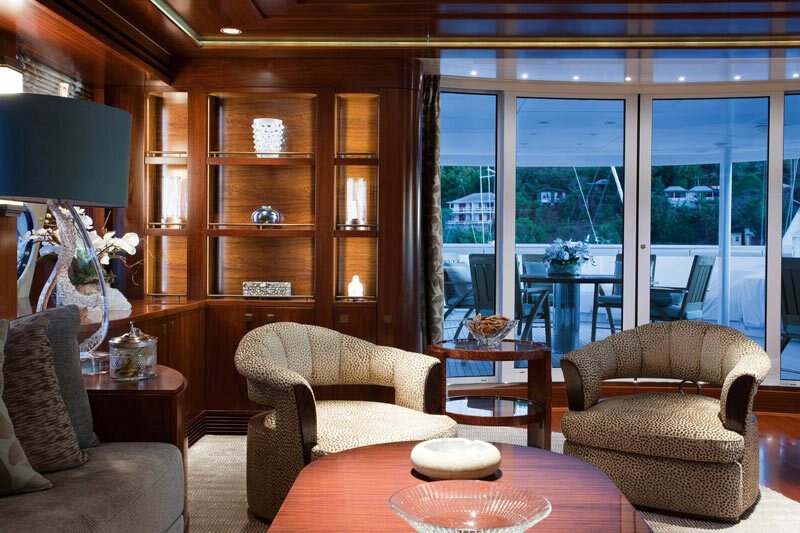 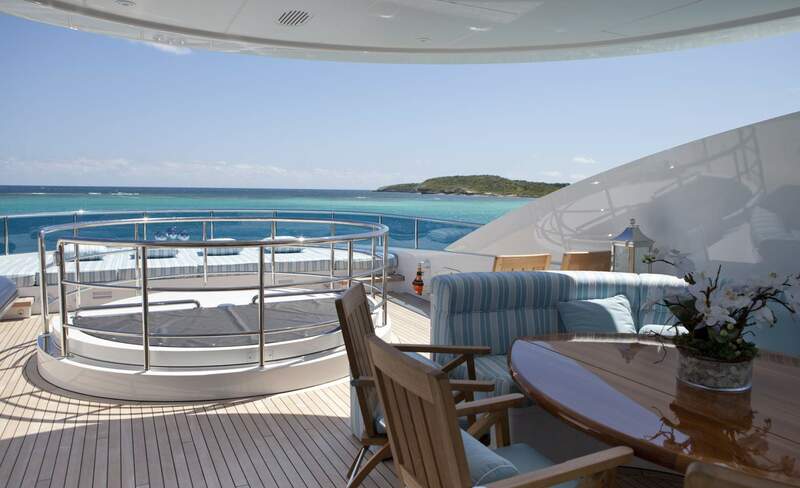 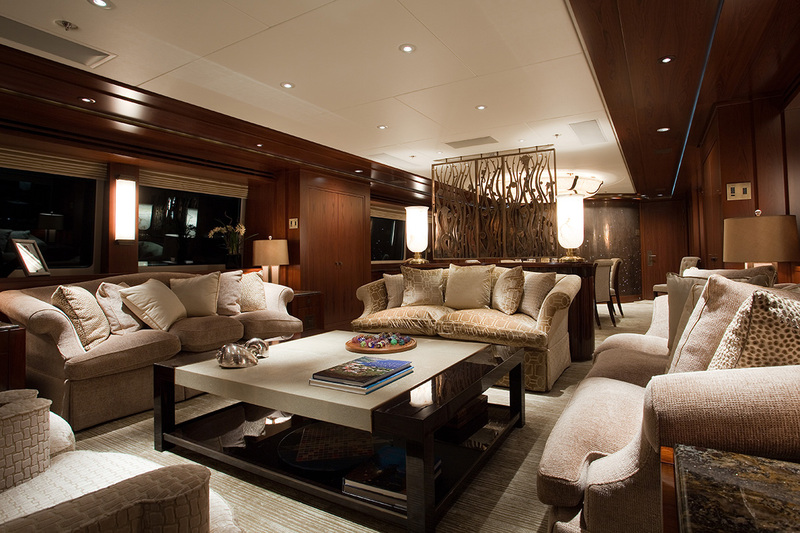 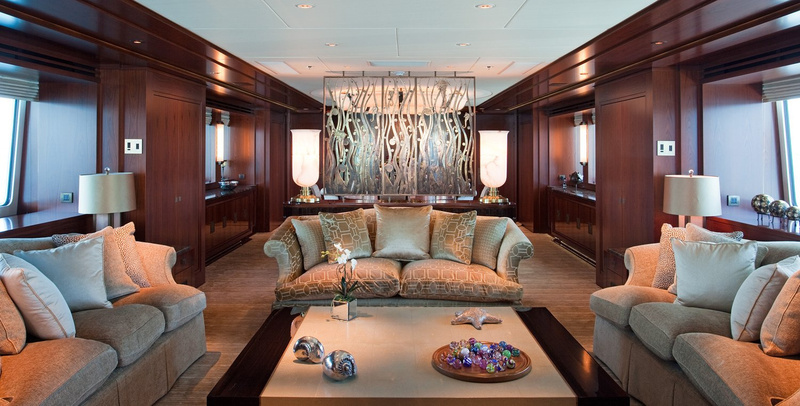 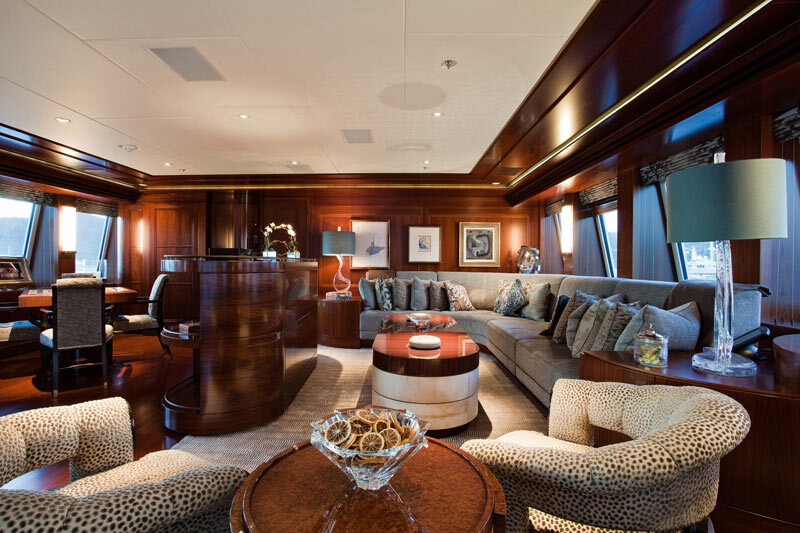 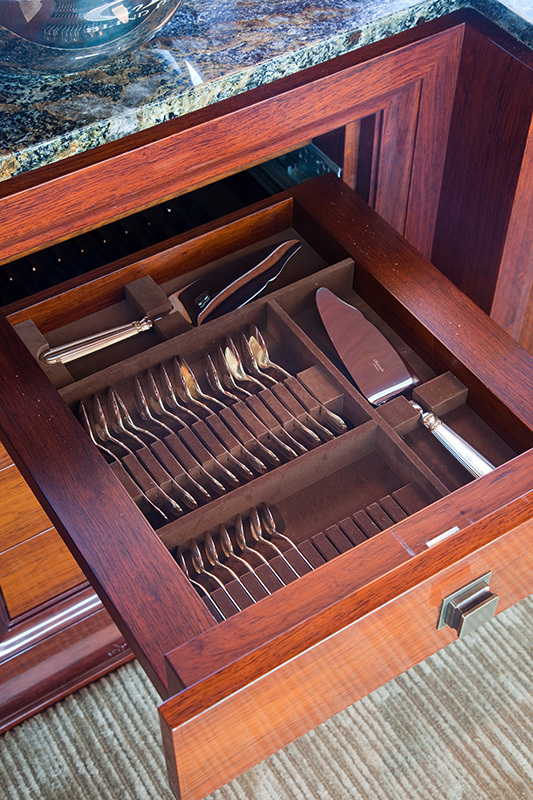 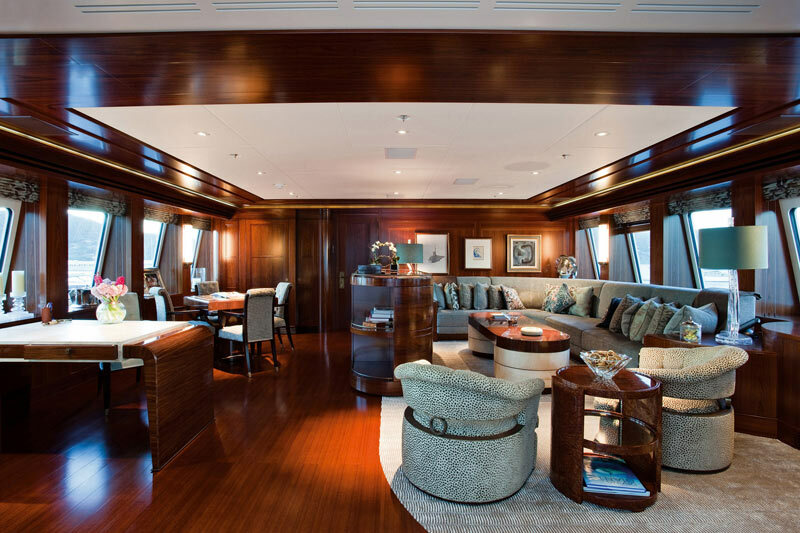 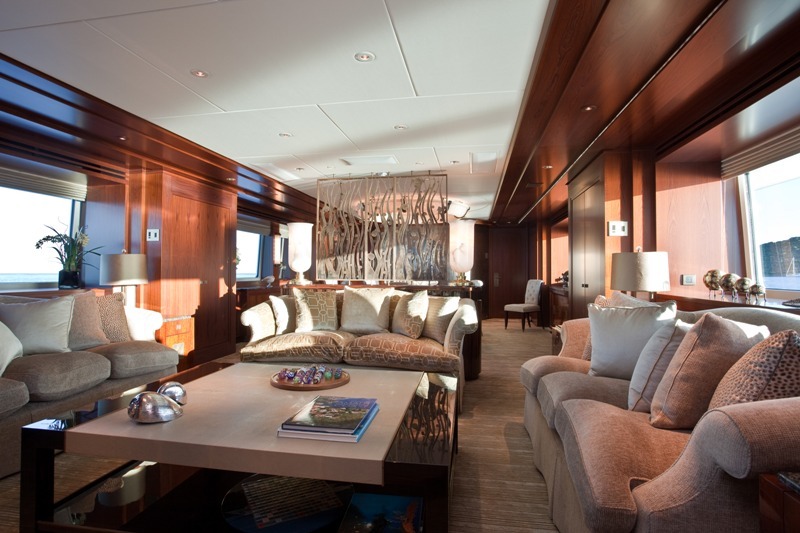 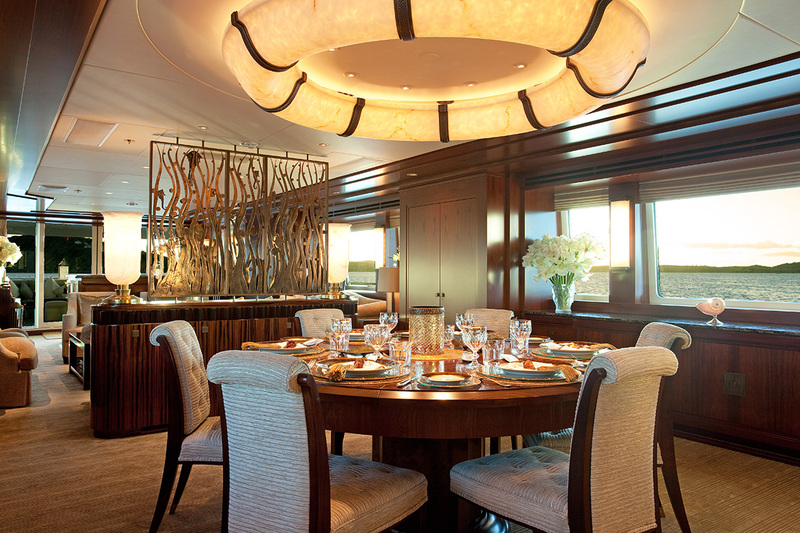 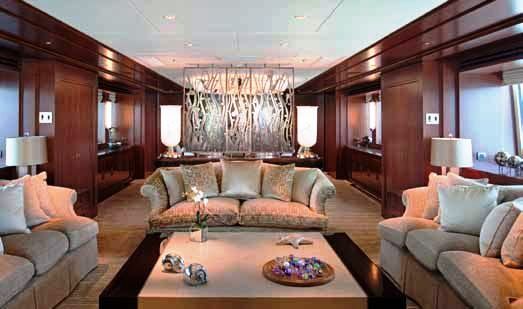 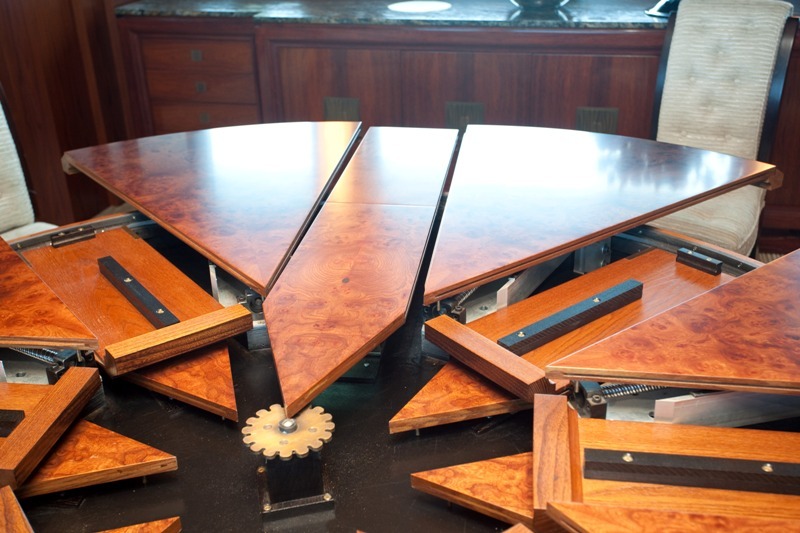 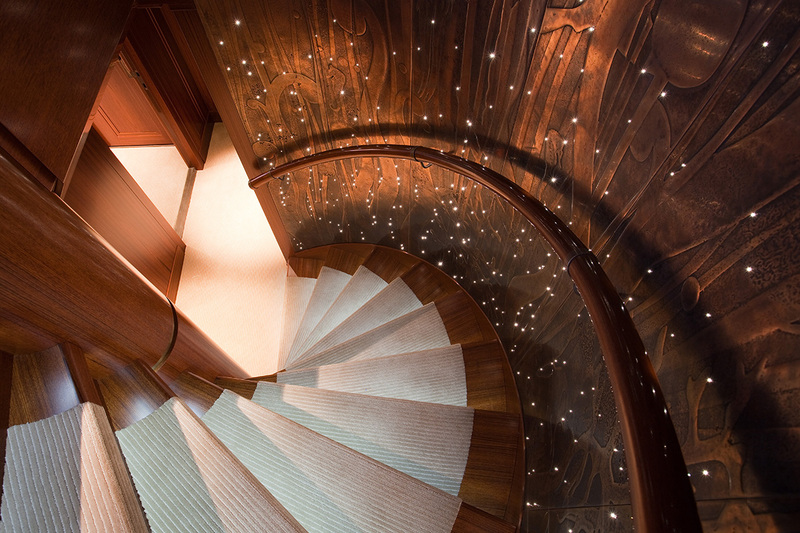 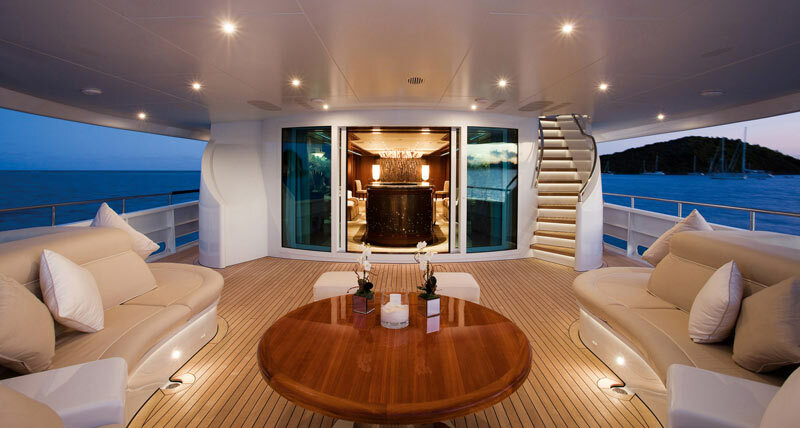 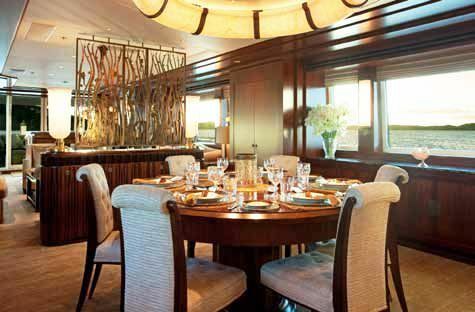 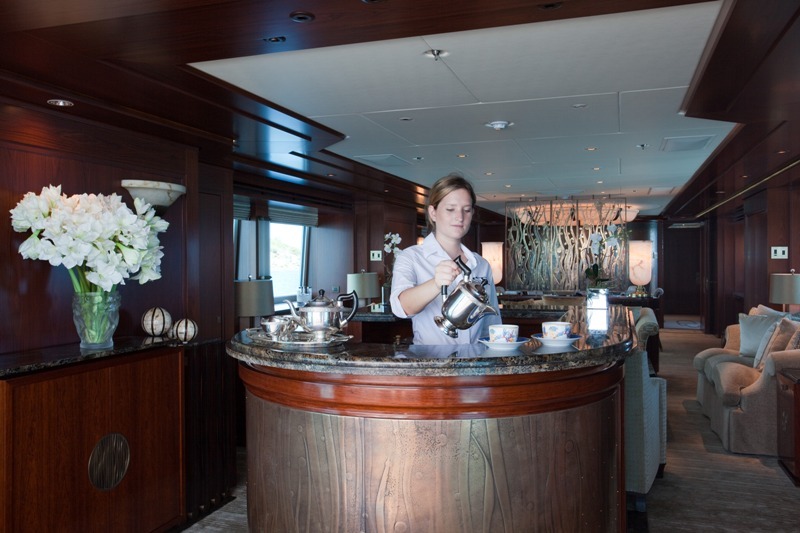 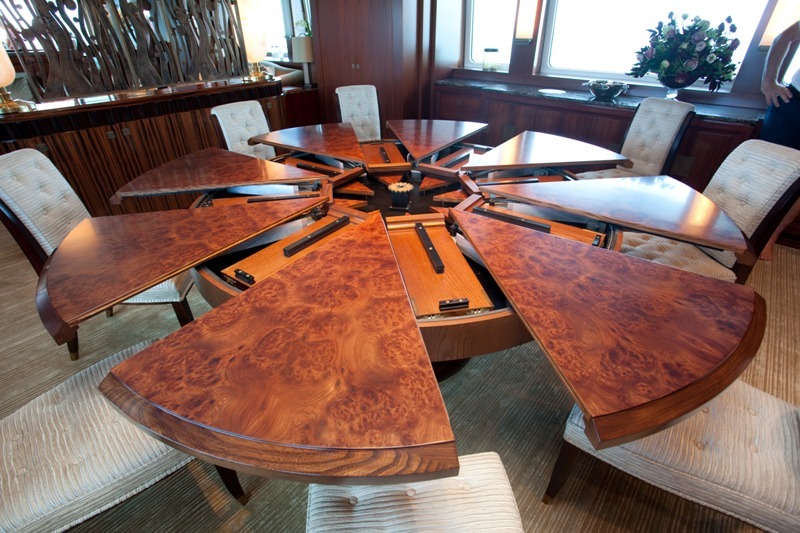 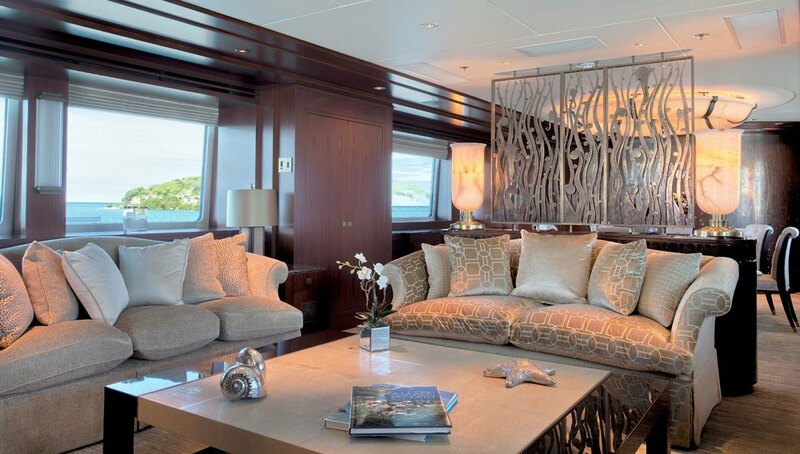 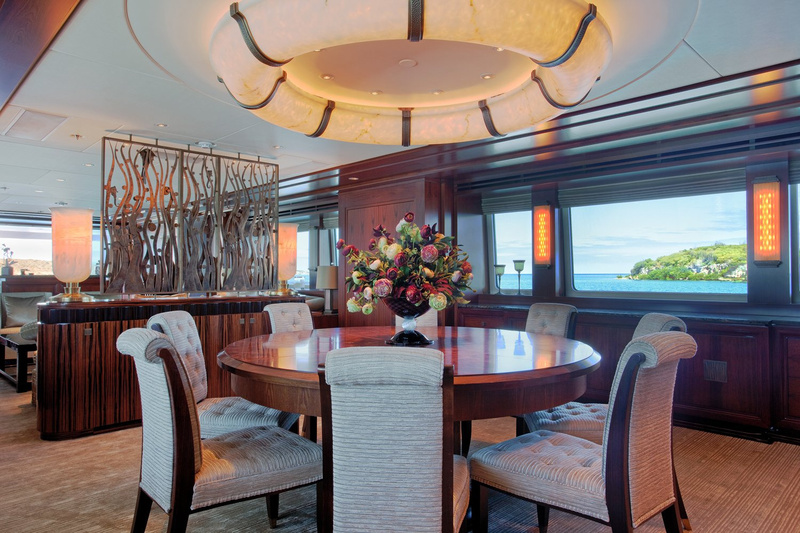 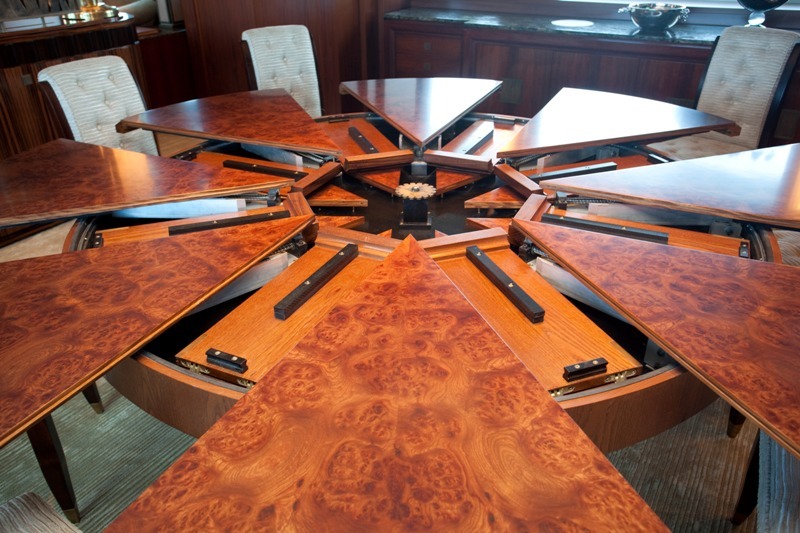 Another custom feature is found in the owner’s suite, which is located forward on the main deck. 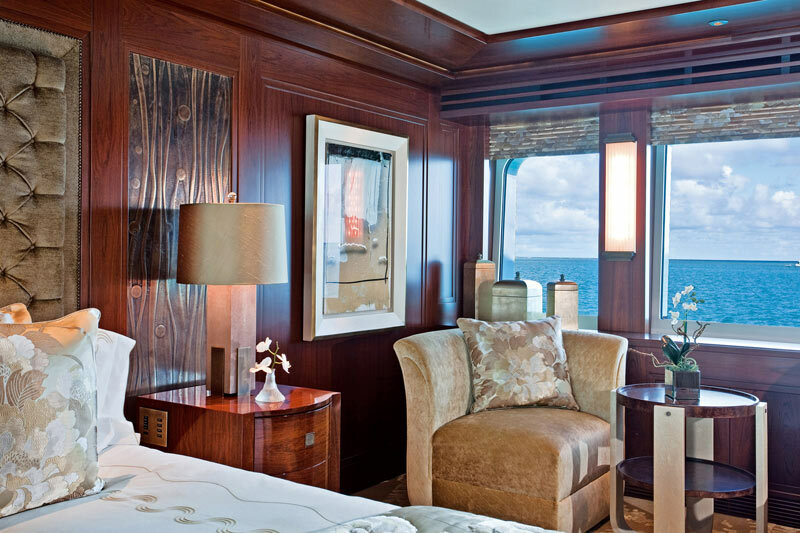 Here the windows are twice their usual size (12.5 sqm), offering fantastic natural light and vistas from the owner’s main stateroom and the accompanying study. 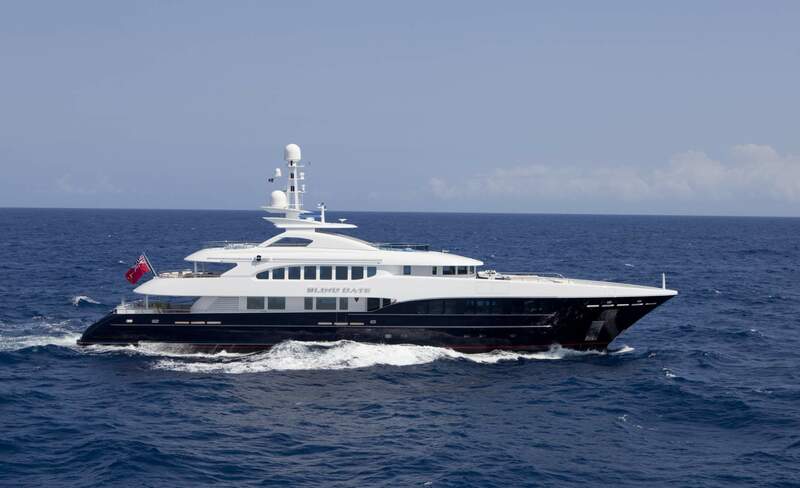 She can attain a top speed of over 15 knots, with two MTU 8V 4000 M70 diesel engines. 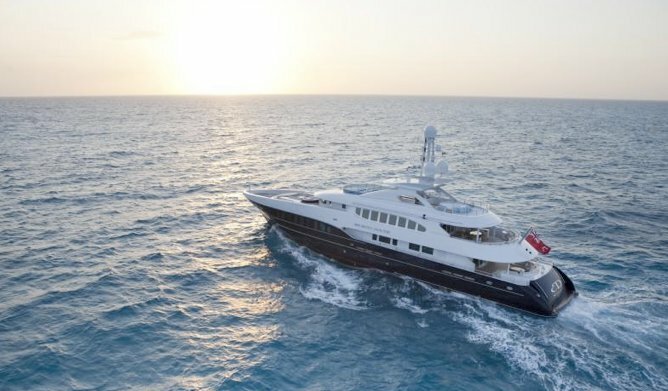 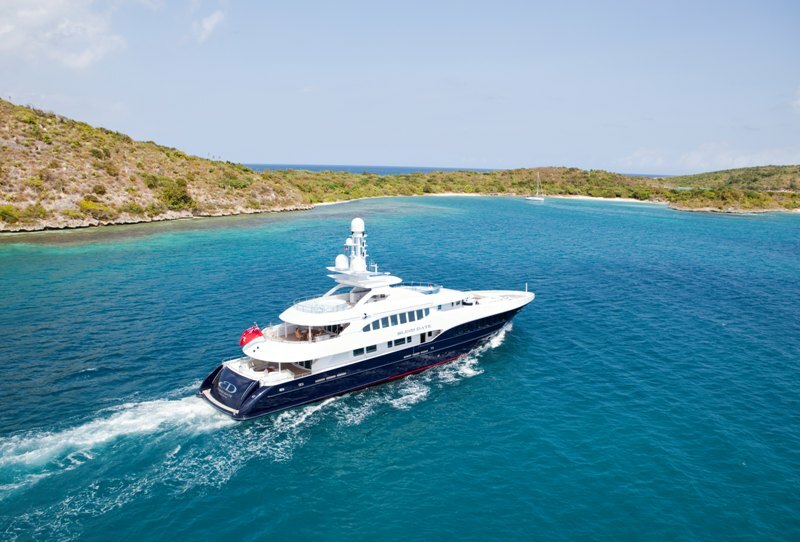 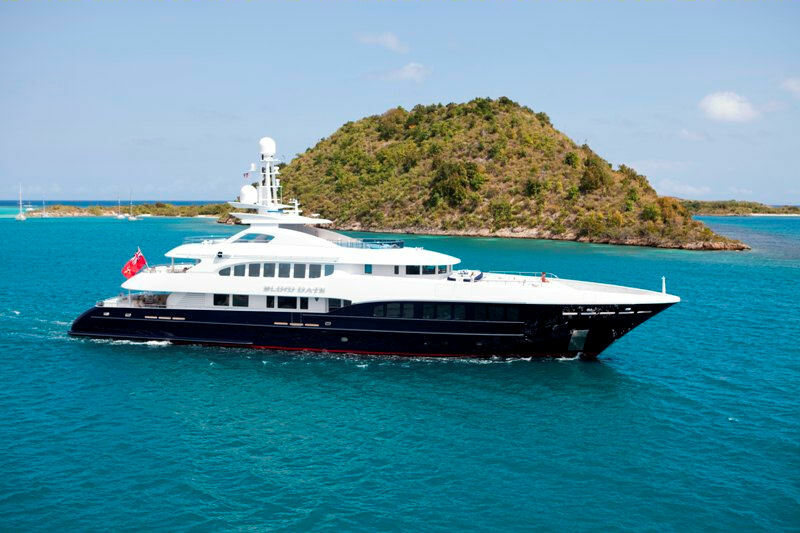 This luxury yacht also features ‘at anchor stabilizers’ which work at zero speed, increasing onboard comfort at anchor and on rough waters. 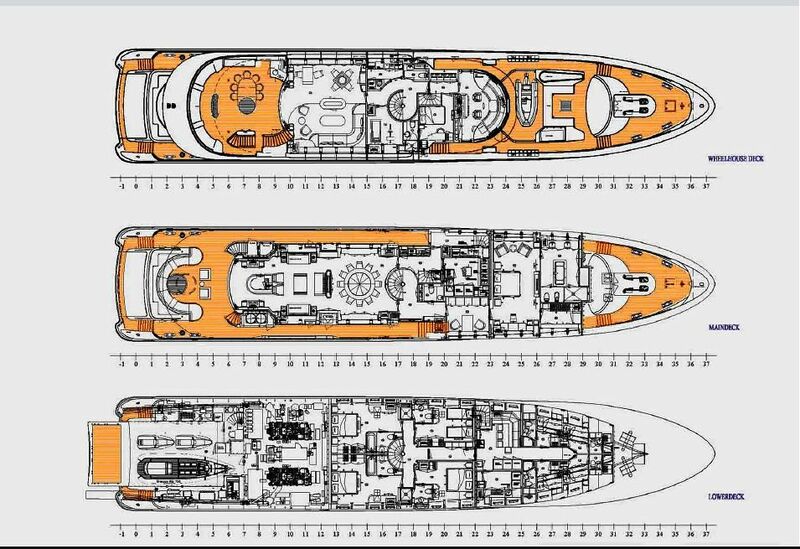 She was built to comply to MCA and Lloyds Register, LMC standards. 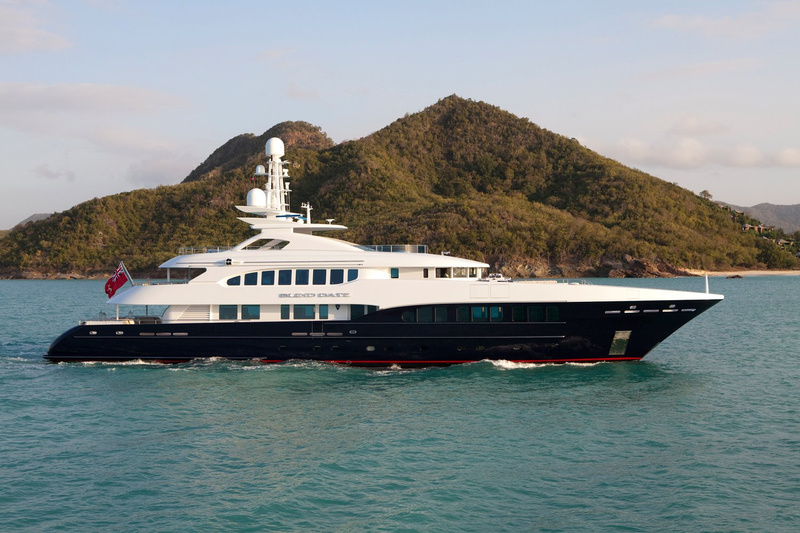 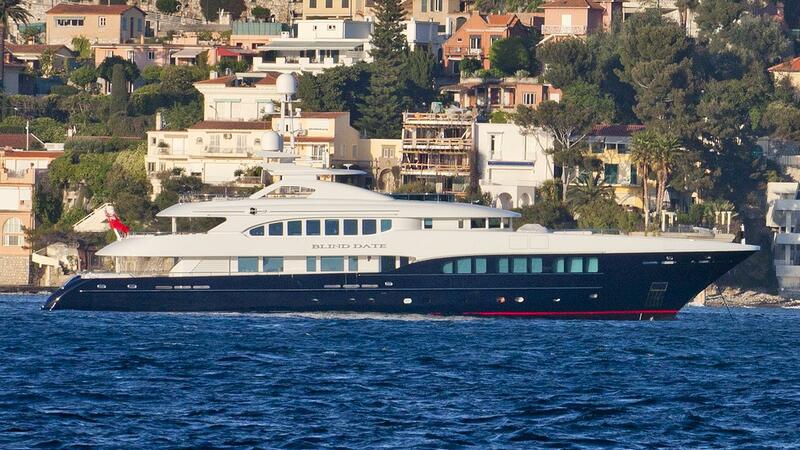 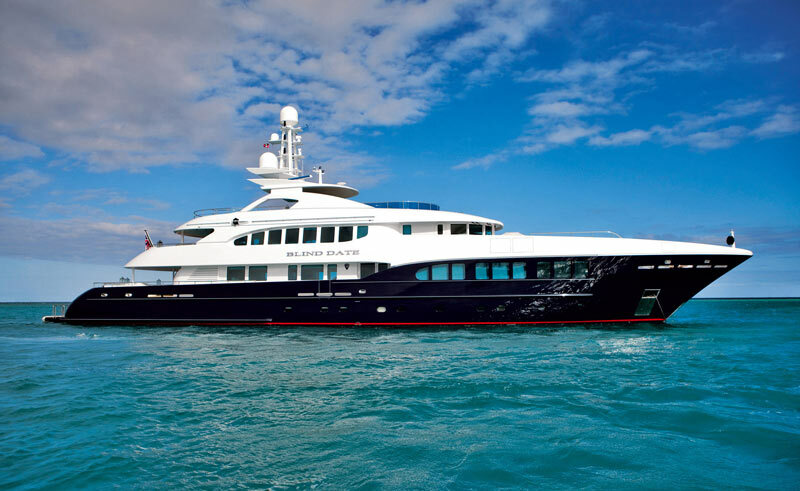 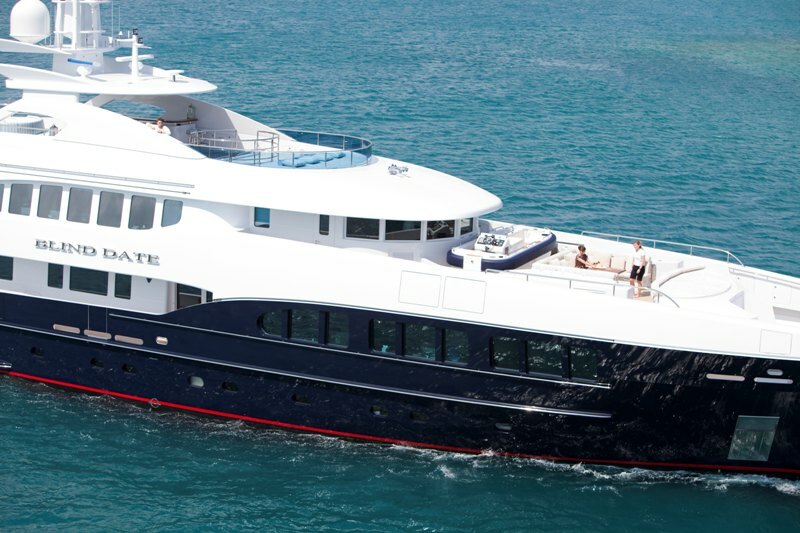 Motor Yacht BLIND DATE is a masterpiece or innovative design, and she takes luxury cruising to a new level. 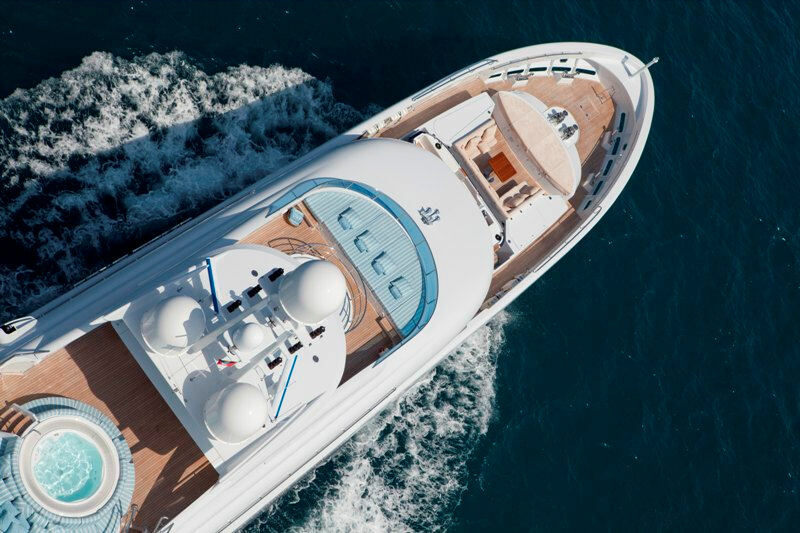 Her enthusiastic and experienced crew of 9 are looking forward to welcoming guests onboard for an exceptional yacht charter vacation. 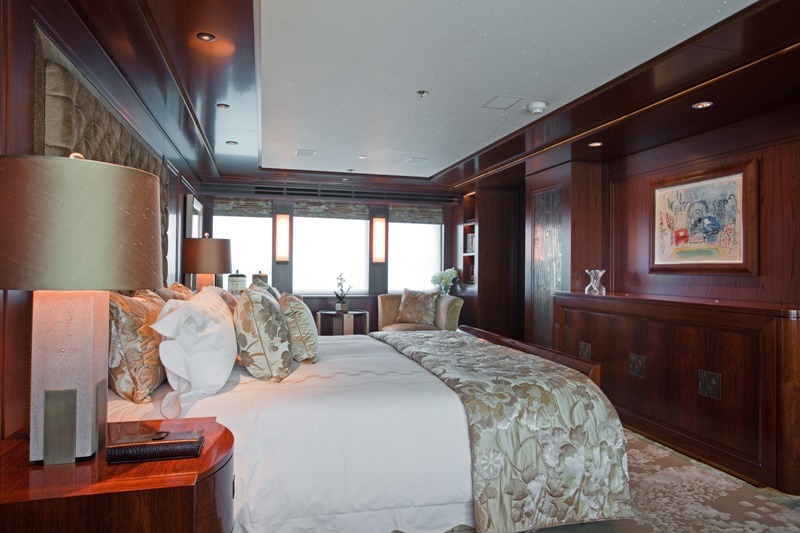 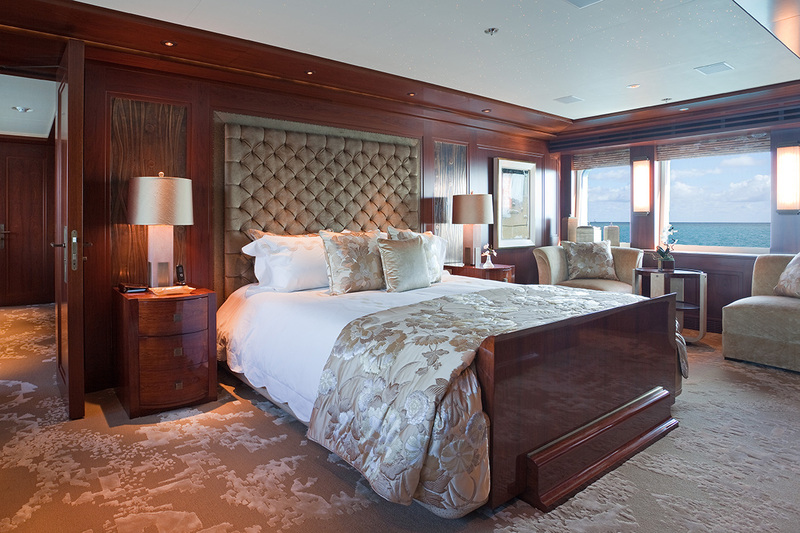 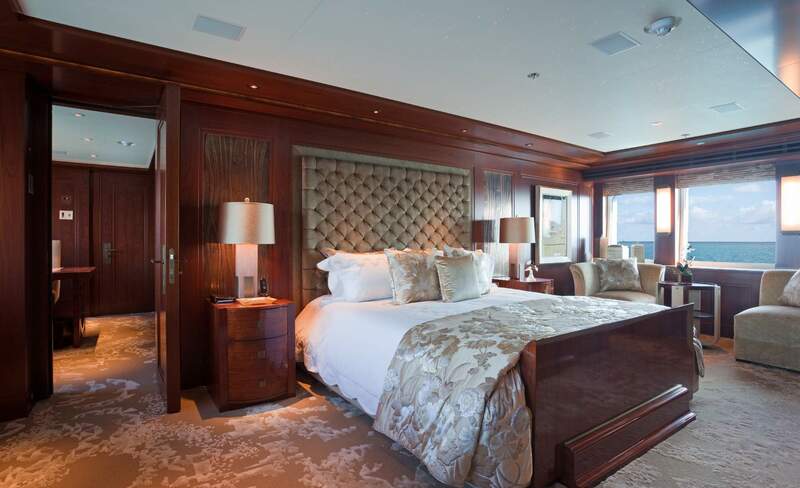 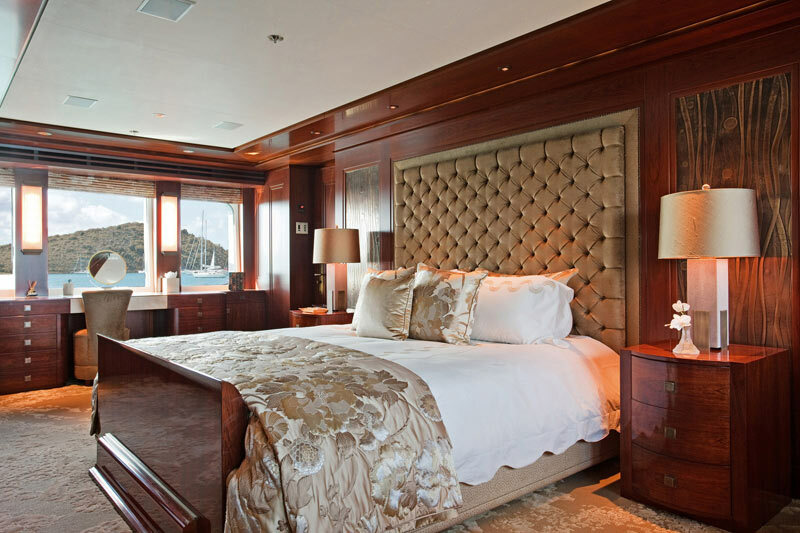 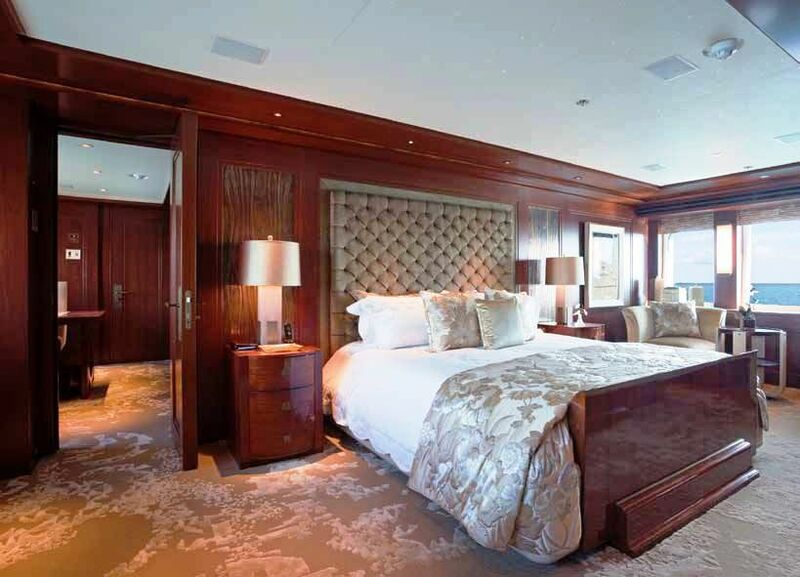 Motor Yacht BLIND DATE offers elegant and spacious accommodation for 10-11 guests in 1 master suite, 1 VIP suite, 2 doubles and 1 twin stateroom with a Pullman bunk. 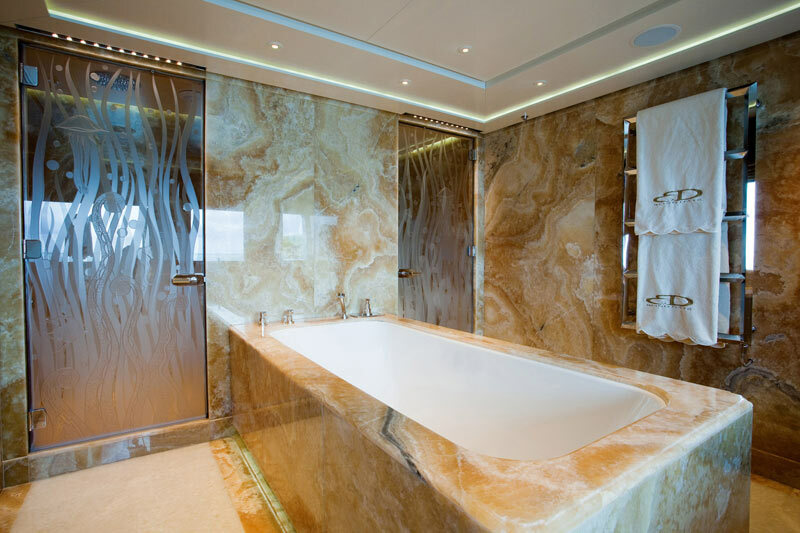 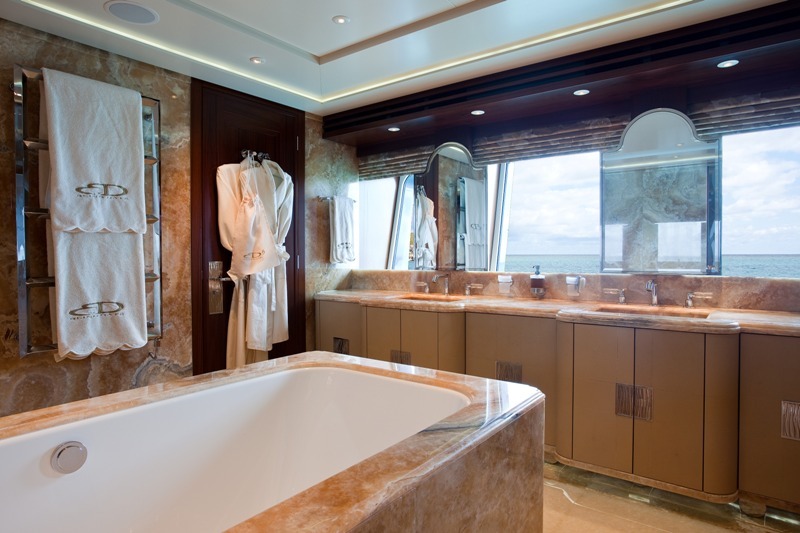 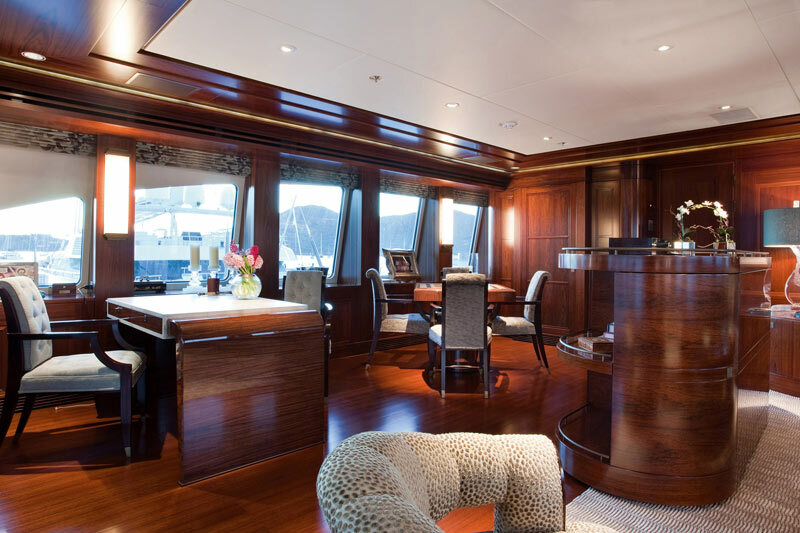 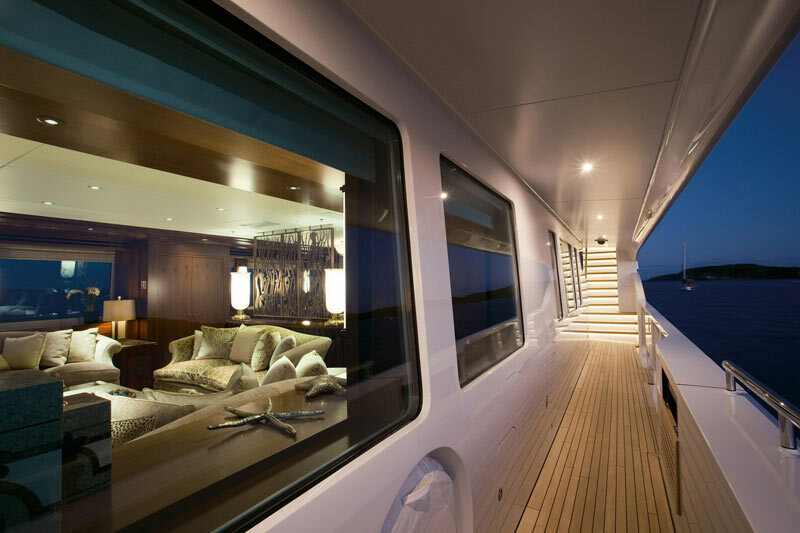 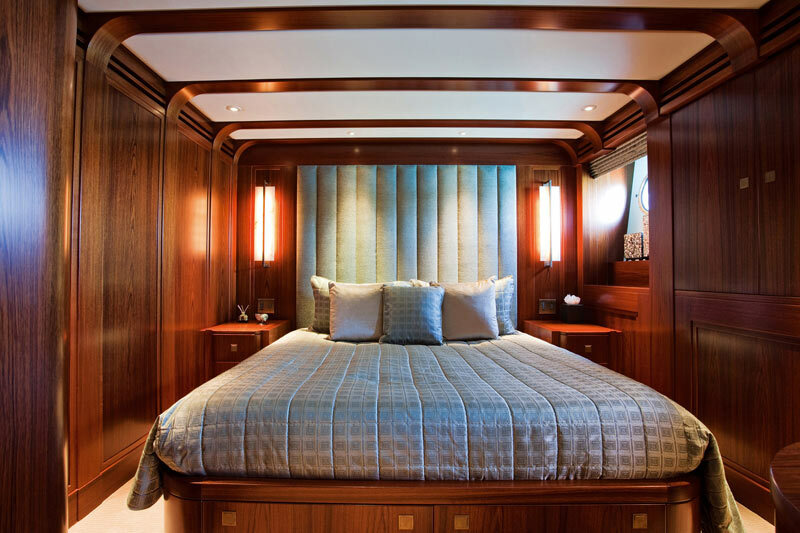 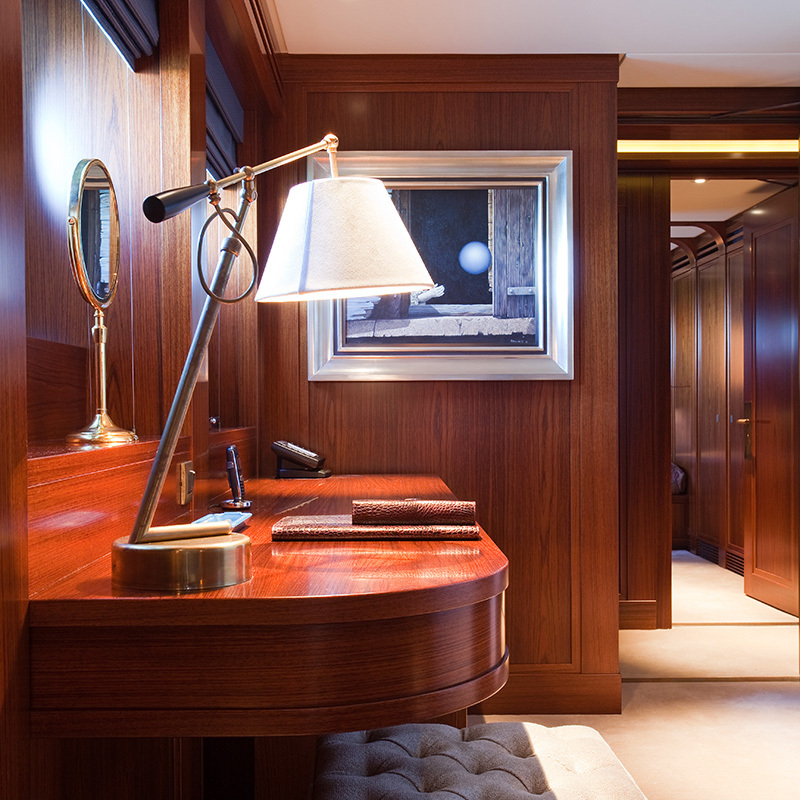 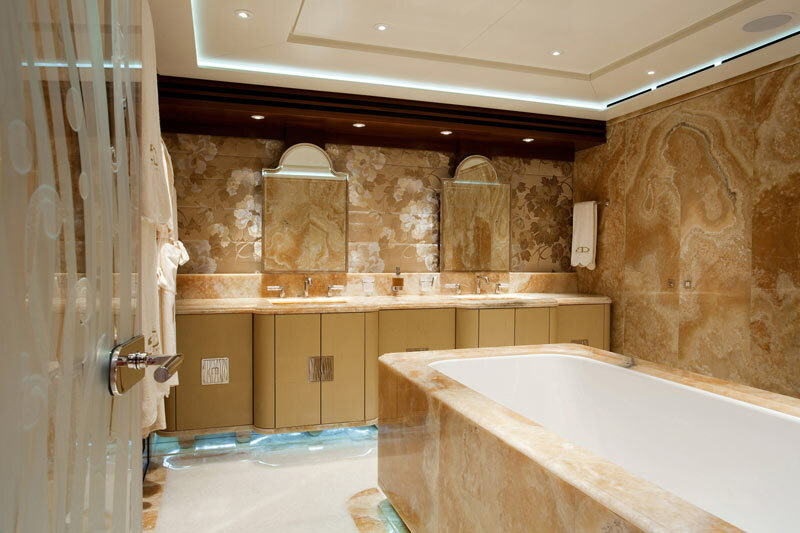 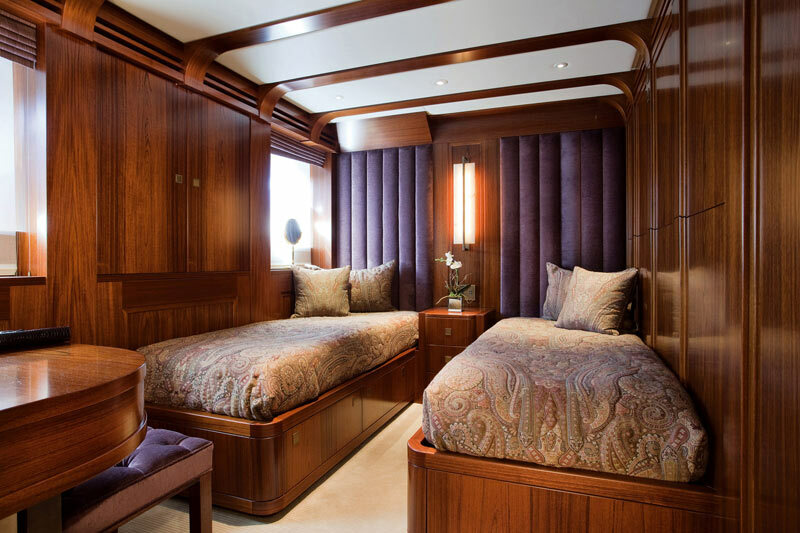 Each cabin comes with a private ensuite bathroom which is individually finished with different semi-precious stones such as Onyx Marina, Botticelli, Smeraldo, and Caramel. 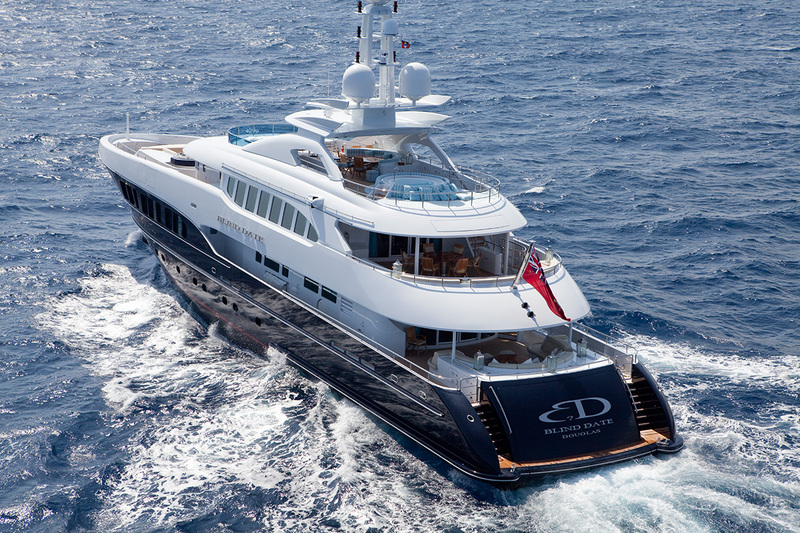 Contact the CharterWorld team for further information on the extras and amenities onboard luxury Heesen motor yacht BLIND DATE. 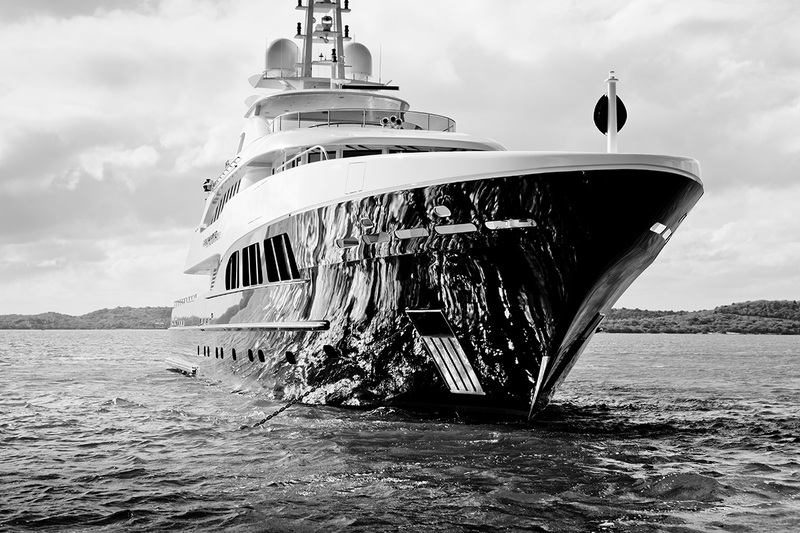 Arthur Brouwer CEO: "At Heesen Yachts we strive to combine engineering and design, with luxury elements such as detailed interiors with high-end materials. 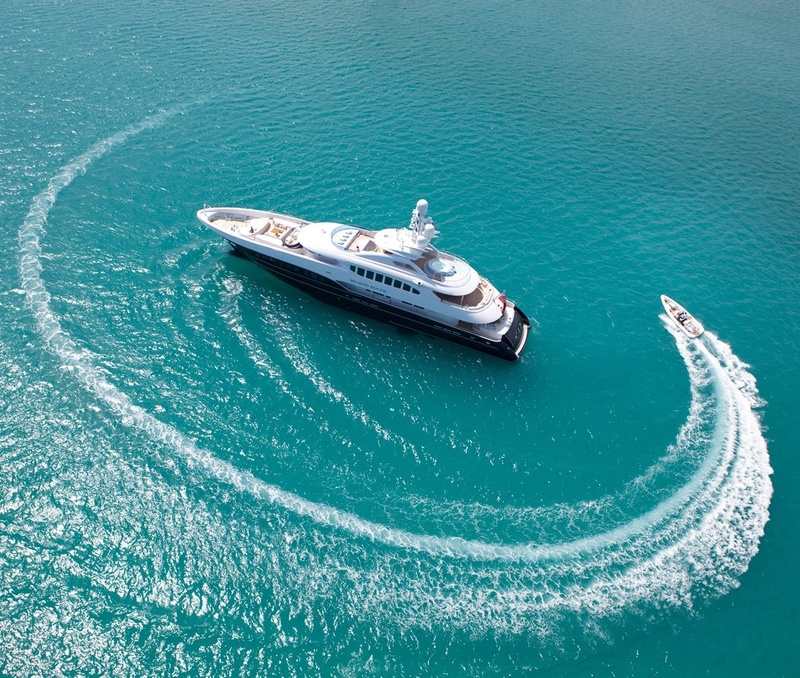 All these aspects are perfected with top-notch technology, innovation and modern cutting edge-design, creating a truly luxurious yacht."